I wish I could come home to this as a snack every day after work. It would be such a nice way to enjoy my afternoon. Though, I know I would have some problems getting Greta to eat a healthier dinner with me chowing down on this dessert. How many other moms out there are hiding in the kitchen eating something not as healthy to prevent child(ren) from wanting what you are eating instead of what you should be eating? Yeah. Well, this dessert isn’t really all the bad. I would share this with Greta, only thing is her palate consists of mac n cheese, yogurt, milk, bread, dried fruit, and food packets right now. 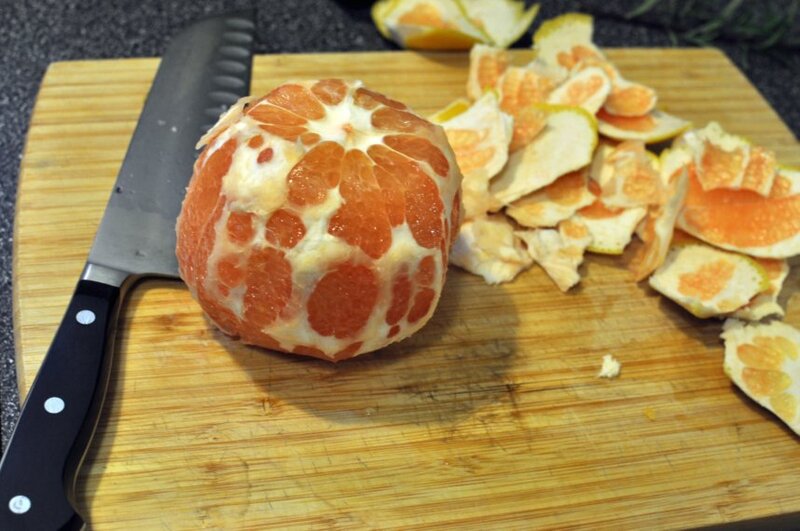 Cut 1 grapefruit in half. I made the mistake of cutting off all the rind. I wish now that I had not, it was harder to eat – the rind would have given the spoon something to scoop the grapefruit flesh out. 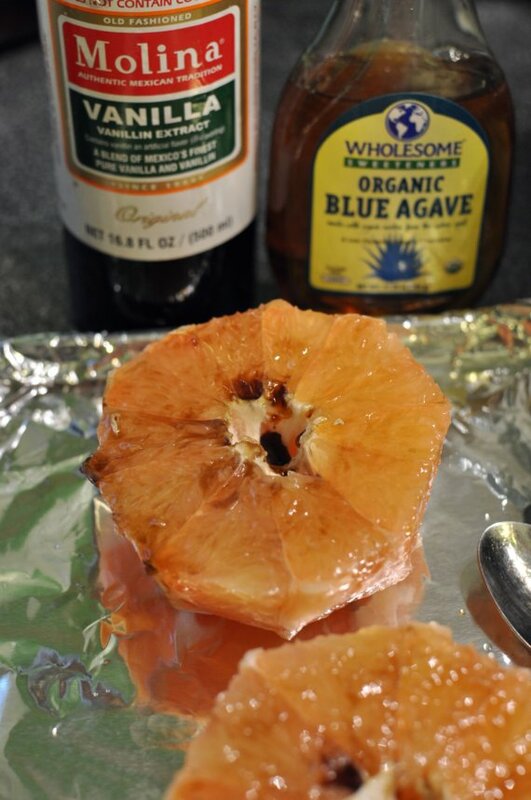 Place grapefruit halves on a foil lined rimmed pan. Drizzle vanilla and agave syrup on top, about 1 spoonful of each, per grapefruit half. Allow to soak in about 10 minutes. 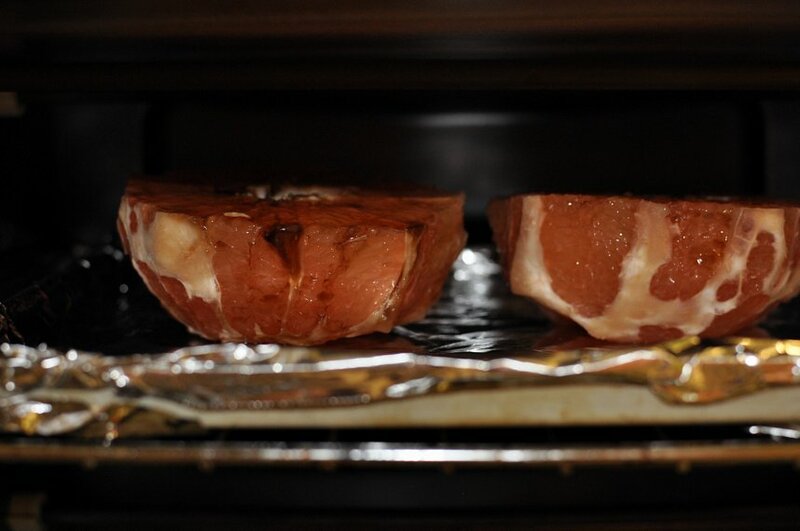 Place grapefruit halves on rack just under broiler. I used the toaster oven for this dessert. Broil for 25 minutes. 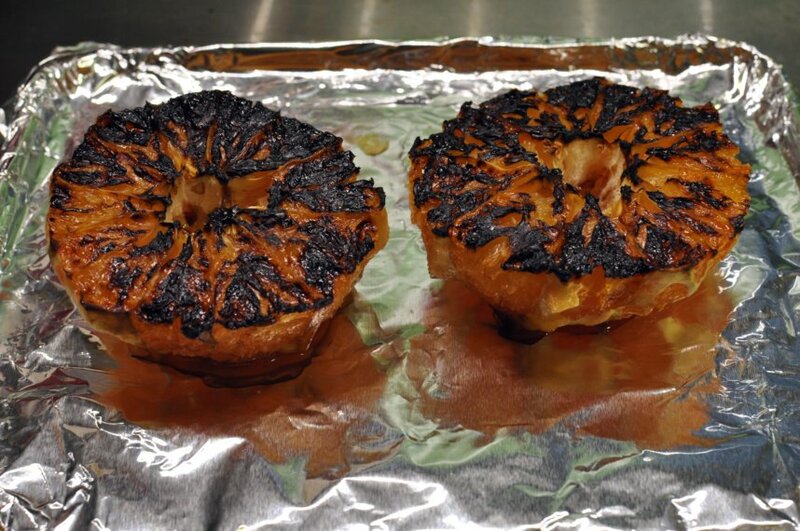 Do not worry – they will look blackened! Serve with chocolate ice cream of your choice. 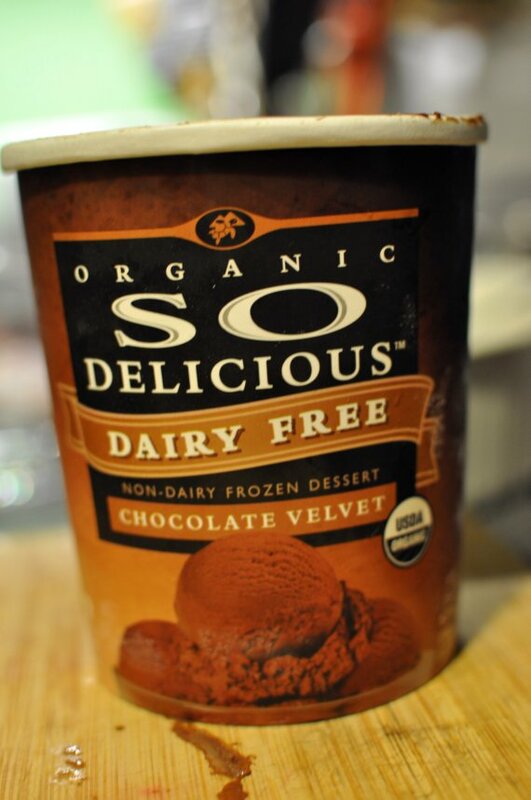 I served ours with chocolate dairy-free ice cream. 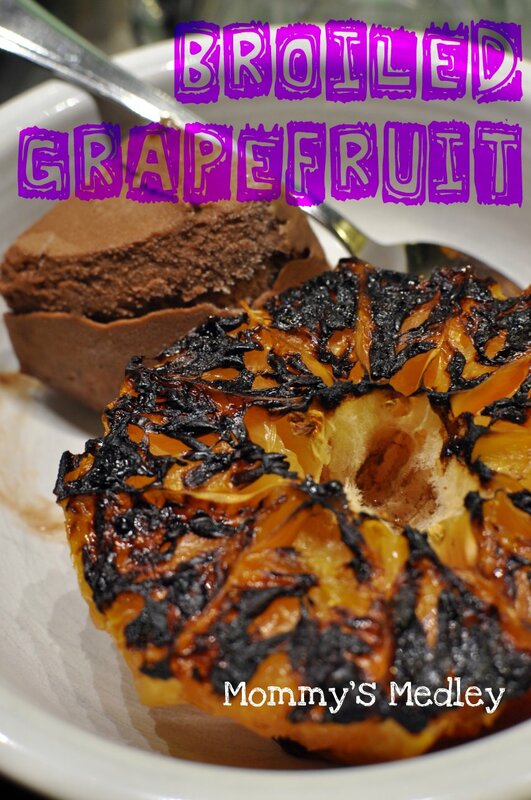 The chocolate and the tart grapefruit were a perfect combination. 1. Cut 1 grapefruit in half. 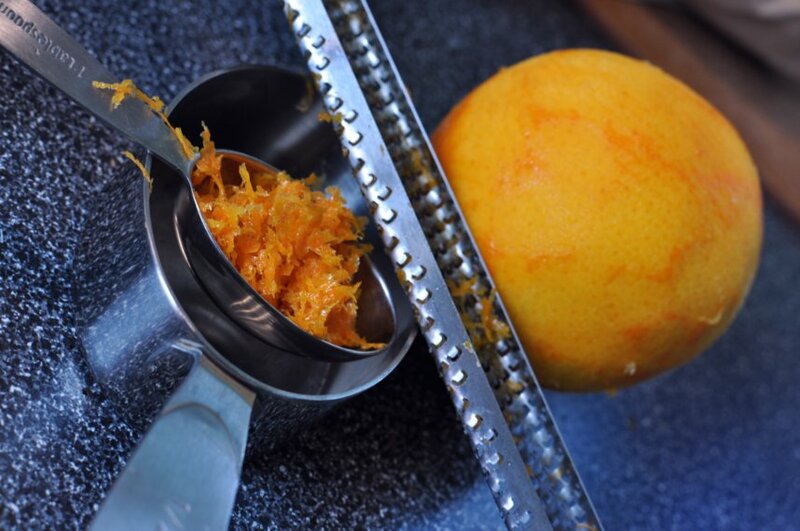 Using paring knife, cut slits along membranes of fruit segments, from the center to the rind. 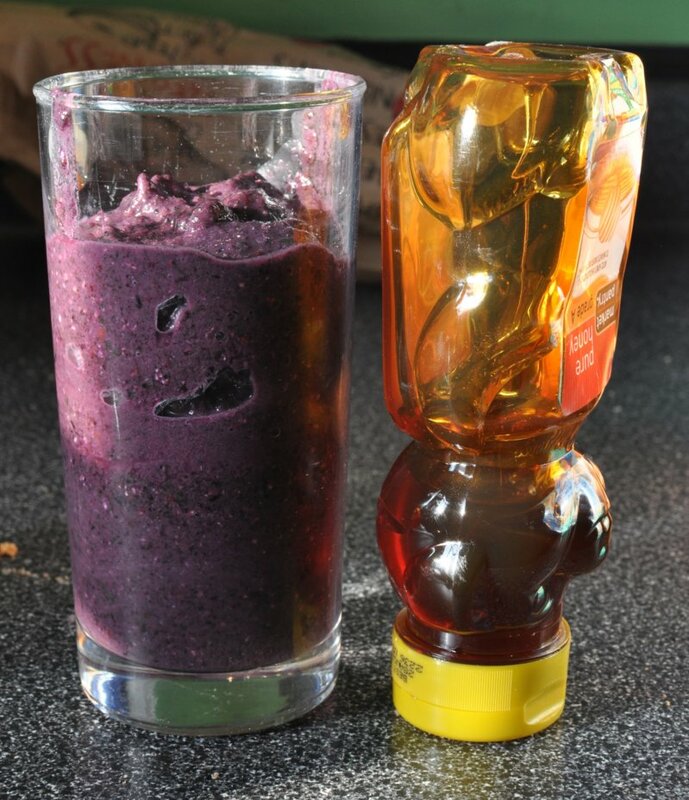 This will help to loosen the fruit and make it easier to eat. Place grapefruit halves on a foil lined rimmed pan. Drizzle 1 spoonful of vanilla and agave syrup on top, per grapefruit half. Allow to soak in about 10 minutes. 2. Place grapefruit halves on rack just under broiler. Broil for 25 minutes. 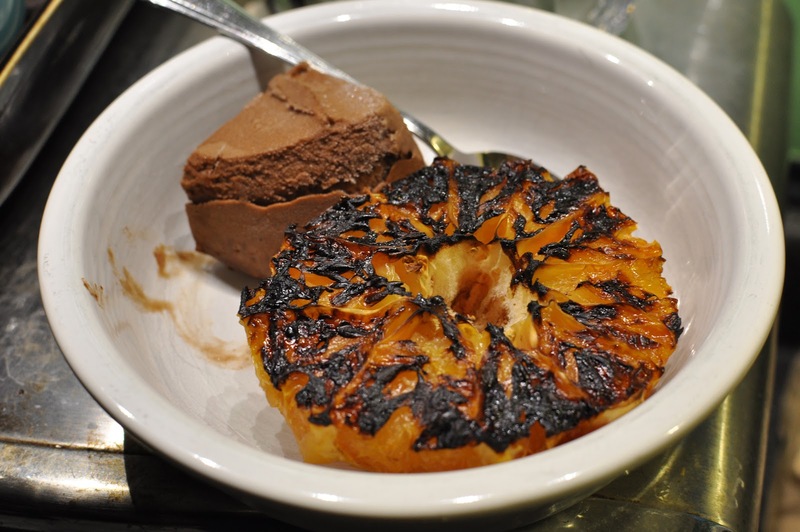 Serve with chocolate ice cream of your choice. I have been seeing roast cabbage everywhere, it seems. 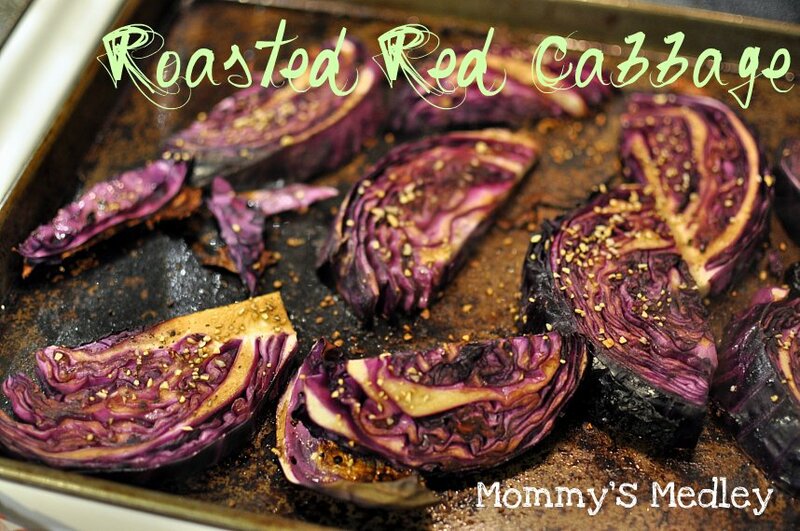 I think I have a Pinterest buddy who wants to make roast cabbage and it has rubbed off on me now. I threw this together for dinner the other night, using items in the pantry. This is an example of how I cook – with little to no measurements. In order to blog, I have to keep a pad of paper and a pencil next to the stove to jot down my quantities and items. Otherwise, I would never be able to duplicate recipes. Start with 1 small head of red cabbage and sliced it into sections no more than 1-1/2 inches thick. 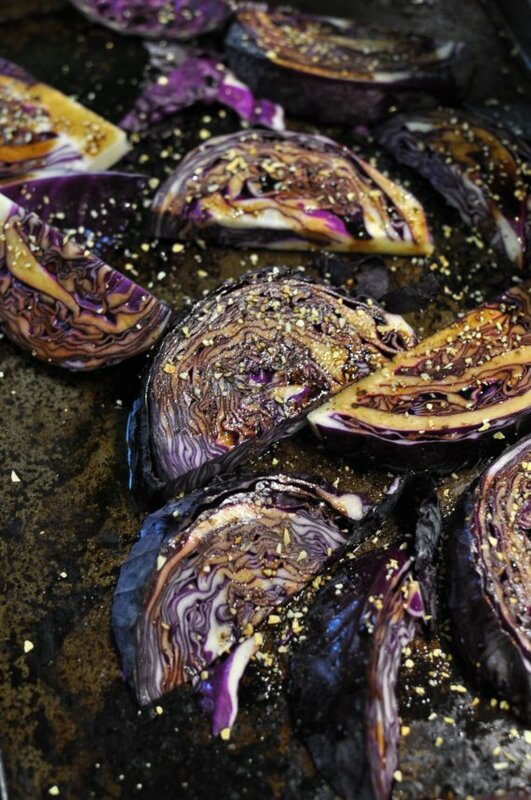 Spread the cabbage out on a rimmed baking sheet. Spray or brush with olive oil. These are the only ingredients I used, plus the cabbage. 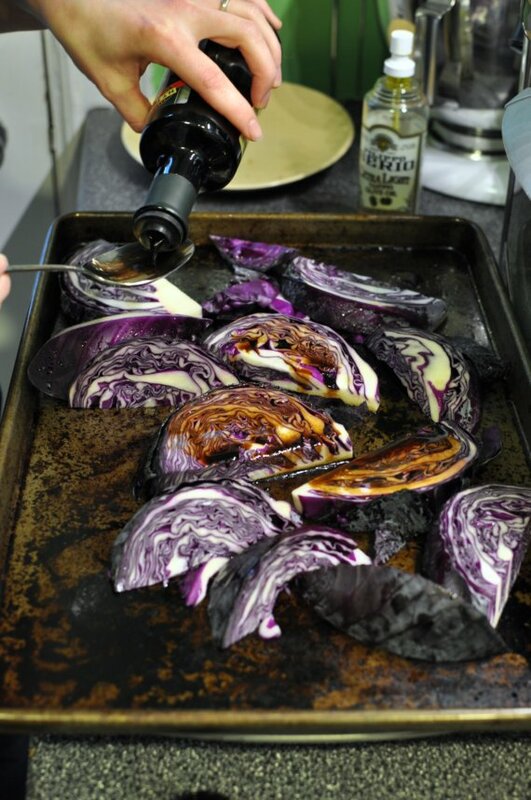 Using a spoon or brush, add balsamic vinegar to each cabbage slice. Flip cabbage to ensure even coverage of oil and vinegar. Sprinkle each cabbage slice with dried minced garlic. Add fresh ground pepper. Bake in oven at 400 degrees for 25 to 30 minutes. Goodness, they are so gorgeously purple and wrinkled – I just want to get out my paints and document them through artists’ eyes. 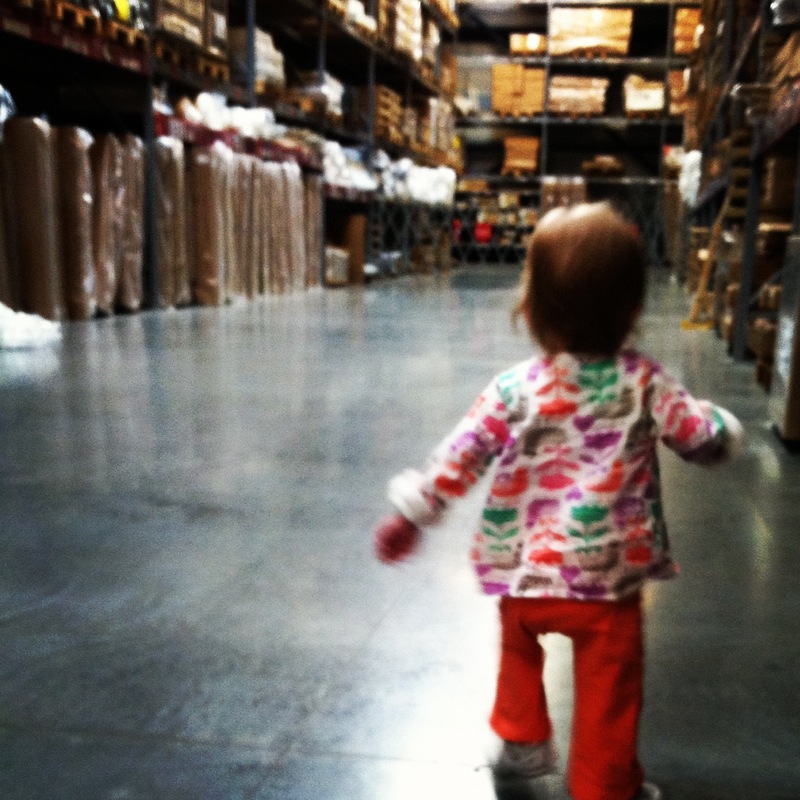 Our weekend flew by – we made a trip to Ikea to get a few things. 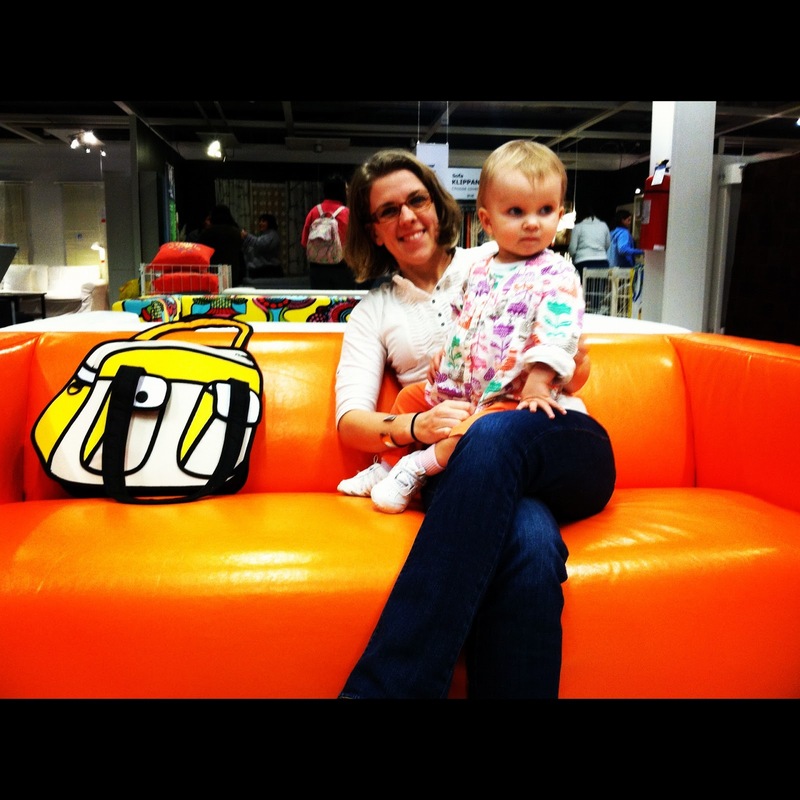 I found this amazing couch which will someday be mine. I know there are plenty of orange haters out there, but it is my color. I am attracted to all things orange like a moth to a porch light. Greta got to the self serve aisles and just wanted to run. 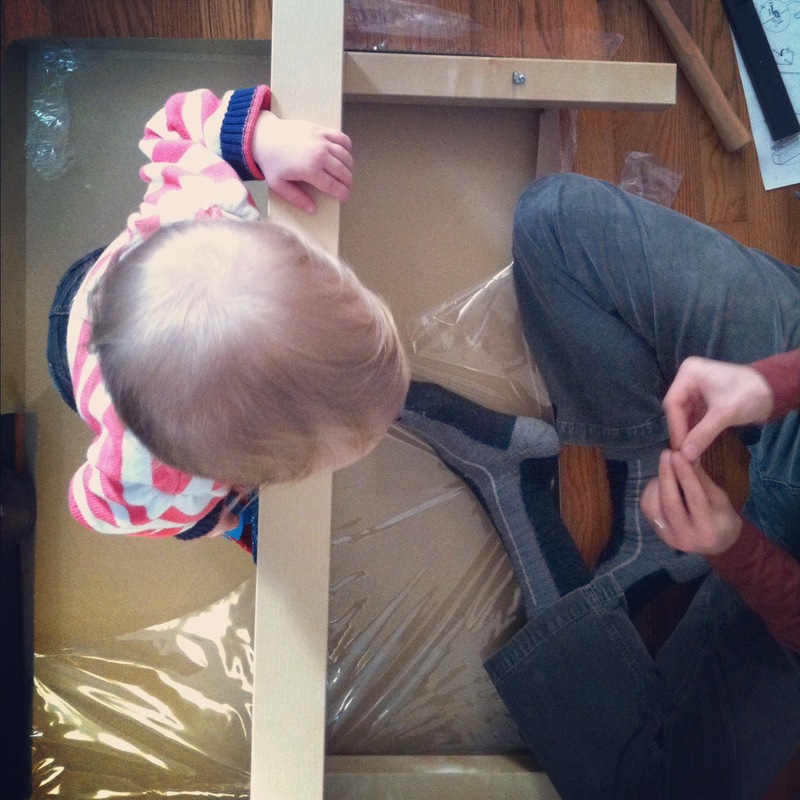 Back at home, Greta was very helpful in putting together a new coffee table. She even knew how to put screws in and that the screwdriver was the tool to use. 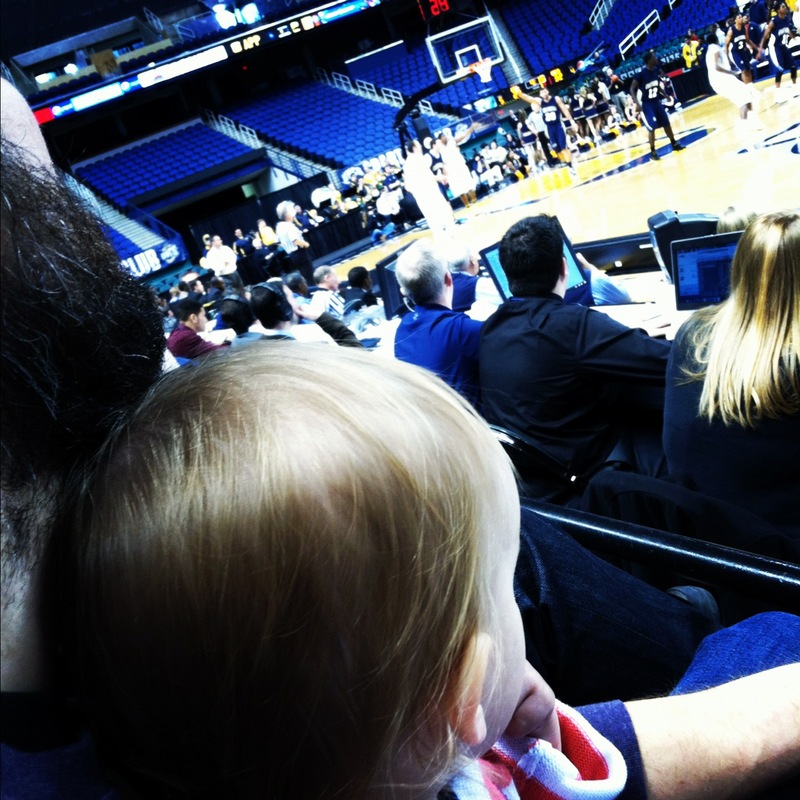 Sunday was the fun day – we took Greta to a UNCG basketball game. She loved the spirit teams and the music. We are off to a late start already this week due to freezing rain, I guess. Hope your Monday is off to a great start! 1. Slice 1 small head of red cabbage and sliced it into sections no more than 1-1/2 inches thick. 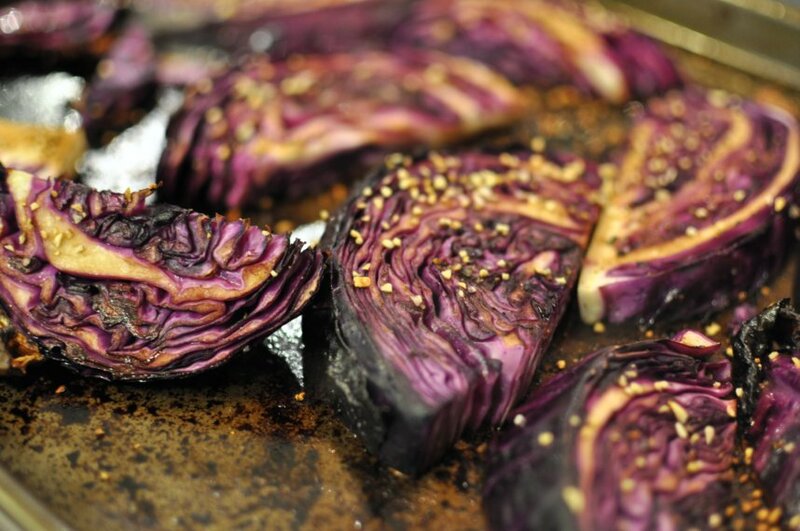 Spread the cabbage out on a rimmed baking sheet. Spray or brush with olive oil. 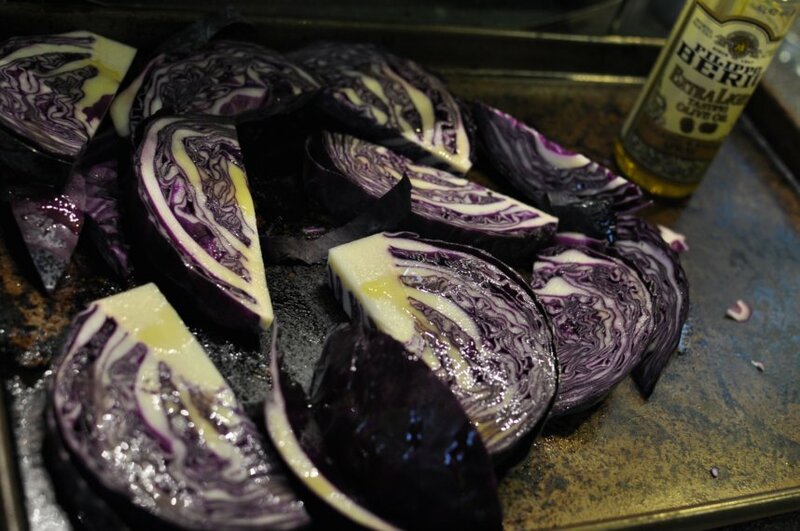 Using a spoon or brush, add balsamic vinegar to each cabbage slice. Flip cabbage to ensure even coverage of oil and vinegar. 2. Sprinkle each cabbage slice with dried minced garlic. 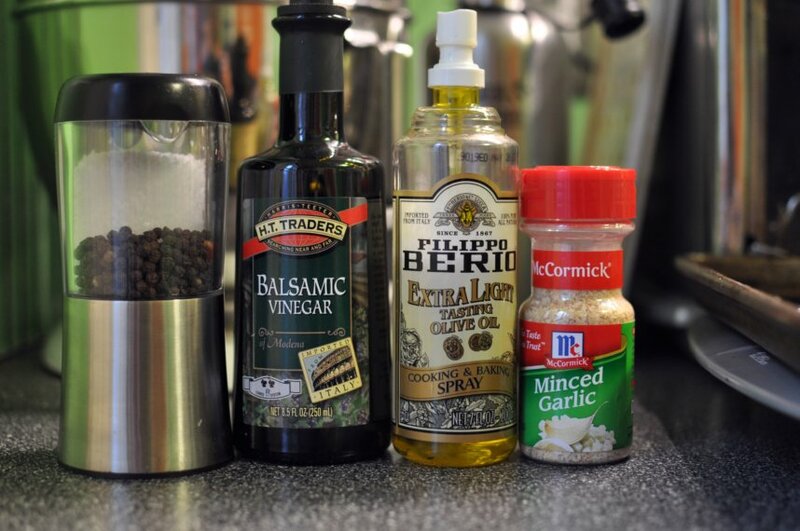 Add fresh ground pepper. Bake in oven at 400 degrees for 25 to 30 minutes. This bowl would be perfect with this dish. My great grandmother had a bowl with a lid that was in the form of a cabbage. She kept candies in it for us and it was the first thing we checked on after hellos at her house as a child. These muffins came about as a result from my weekly brainstorming about scones, tea, and English snacks in preparation for my Sunday English connection recipe in celebration of a new Downton Abbey. Tune in Sunday evenings 9/8 central on PBS! I love using a glass measuring cup instead of a small bowl when baking – it is easy to handle, easy to microwave, and easy to wash – just throw it in the dishwasher. I used Tazo tea for this recipe. 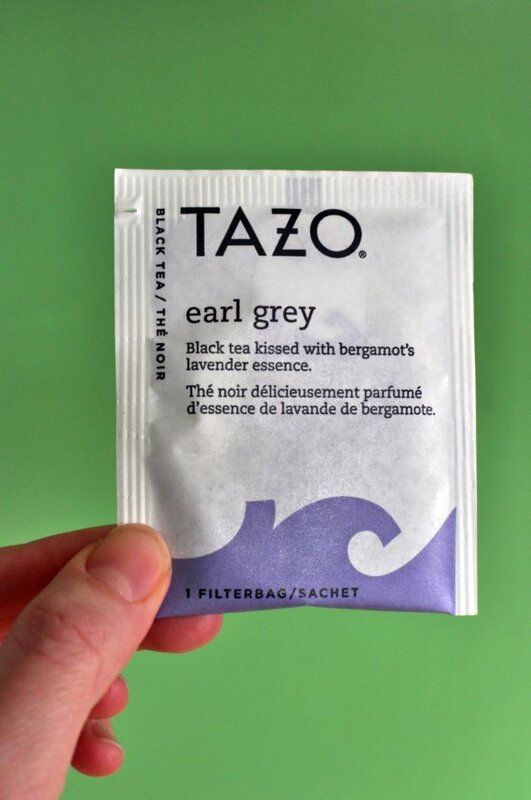 The earl grey is a lovely flavor – black tea with the orange flavor of bergamot and a touch of lavender. 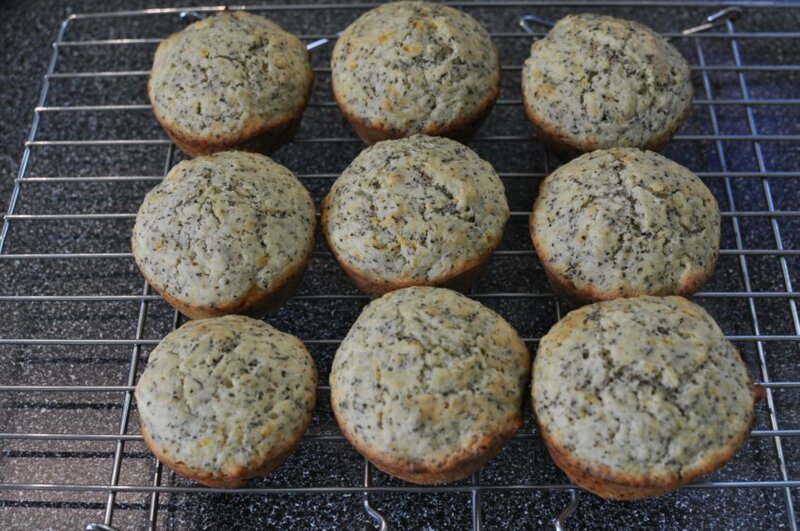 To include the tea in these muffins, I simply cut open 4 tea bags and poured them into a measuring spoon. Then, I mixed the tea directly into the flour mixture. I added orange zest to bring out the bergamot flavor even more. I used about 1/2 an orange for the zest in this recipe. Make a well in the dry ingredients to make mixing easier. I like my muffins bigger so I filled only 11 cups for this recipe. As you can see, there are already a few missing – these were pretty popular around here this afternoon. 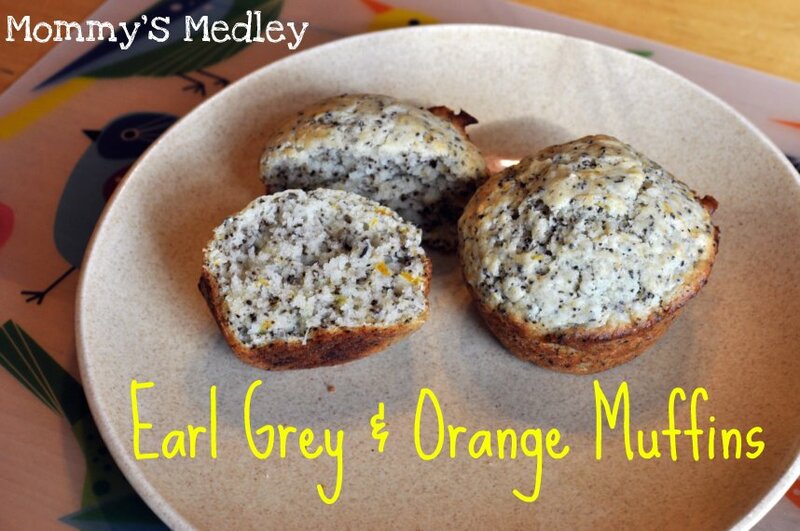 These lovely muffins turn a nice golden brown – they almost remind me of a lemon poppy seed but I think the flavor is more subtle and less sweet. The muffin recipe below, from Better Homes and Gardens New Baking Book, minus the flavorings, is a perfect base for any muffin. Just swap in other ingredients. Blueberry muffins – add 1 cup blueberries. Chocolate chip muffins – add 1 cup chocolate chips. 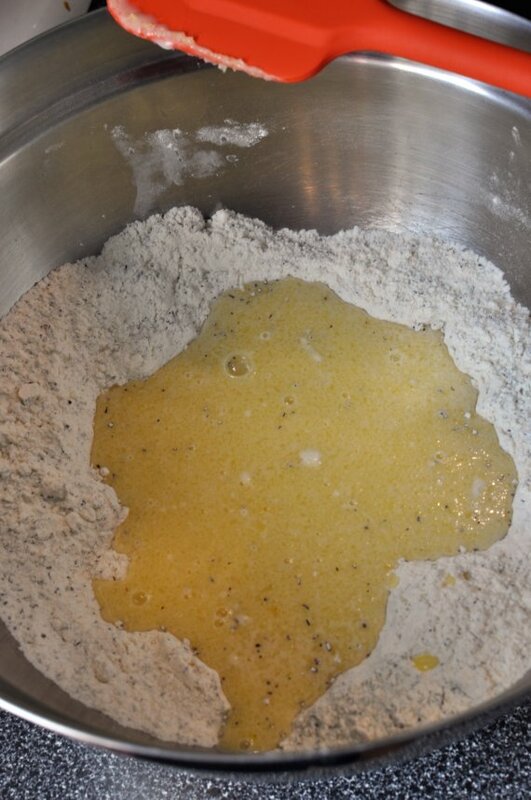 Lemon poppy seed – add 1 tablespoon lemon zest, 1 tablespoon poppy seeds, plus increase sugar to 1/2 cup. Cranberry muffins – add 1 cup coarsely chopped cranberries plus 2 extra tablespoons sugar. Banana muffins – reduce milk to 1/2 cup, add 3/4 cup mashed banana, and no paper liners. 1. Grease eleven or twelve 2-1/2 inch muffin cups or line with paper liners, set aside. In a medium mixing bowl combine 1-3/4 cups flour, 1/3 cup sugar, and 2 teaspoons baking powder. 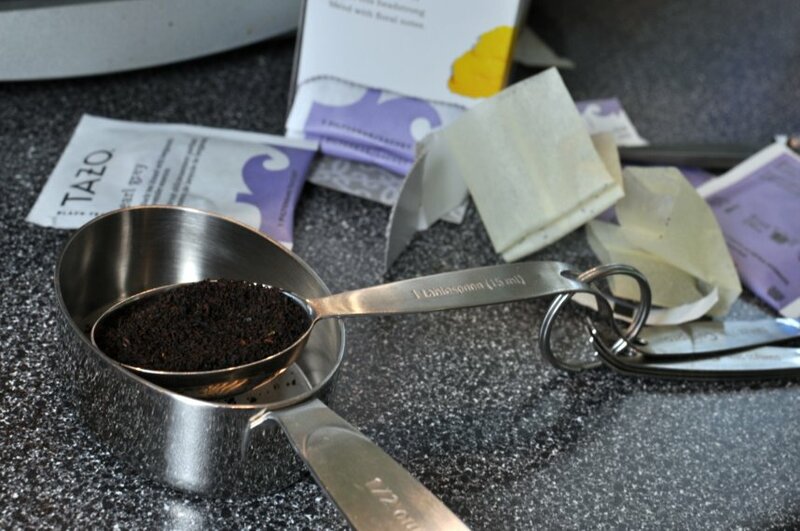 Add 2 tablespoons early grey tea (from about 4 teabags) and 1 tablespoon orange zest. Mix well. Make a well in the center of the dry ingredients. 2. 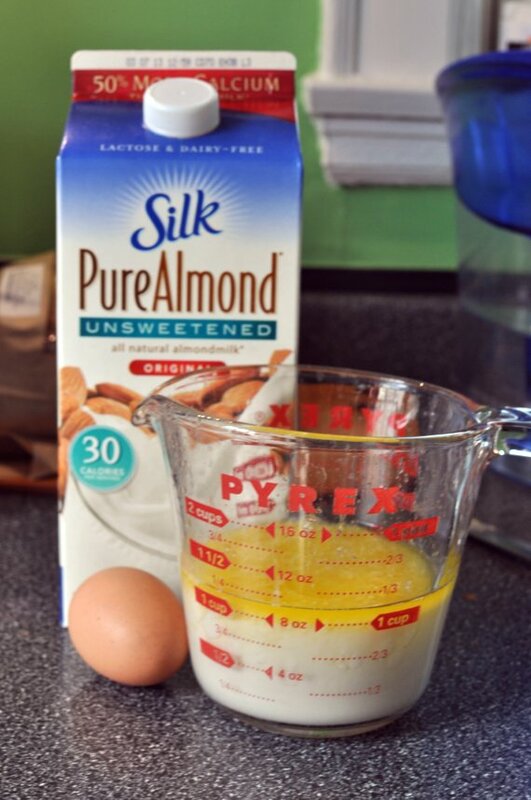 In another mixing bowl, or glass measuring cup, combine 1 egg, 1/4 cup melted margarine or butter, and 3/4 cup (almond) milk. Add the egg mixture all at once to the dry mixture. 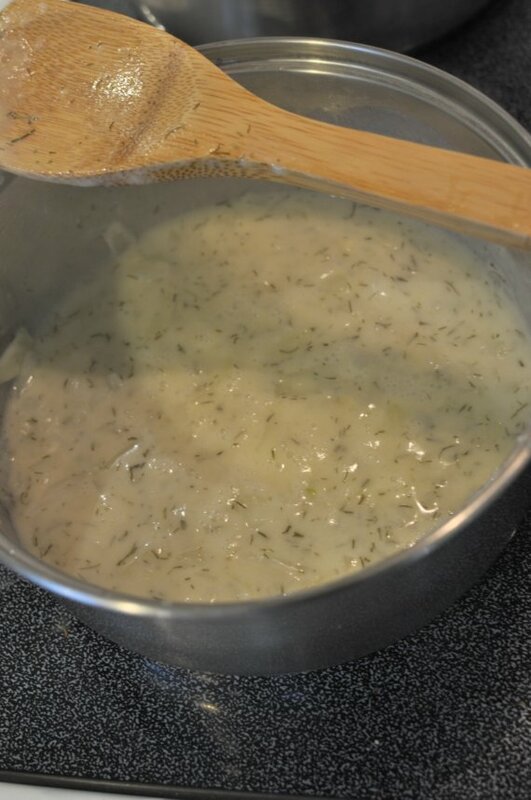 Stir just until moistened – batter will be lumpy. 3. 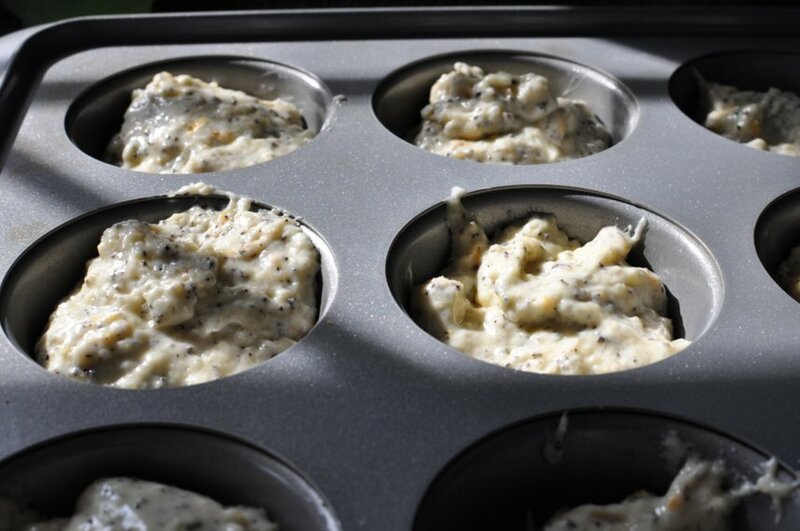 Spoon batter into prepared muffin pan, filling each cup 2/3 full. Bake at 400 degrees for about 20 minutes, till golden. Cool in pan, on a rack for 5 minutes. Remove and serve warm. Ok, this is a ‘Take it Easy Tonight, Mommy’ dinner. Those are my favorite meals. 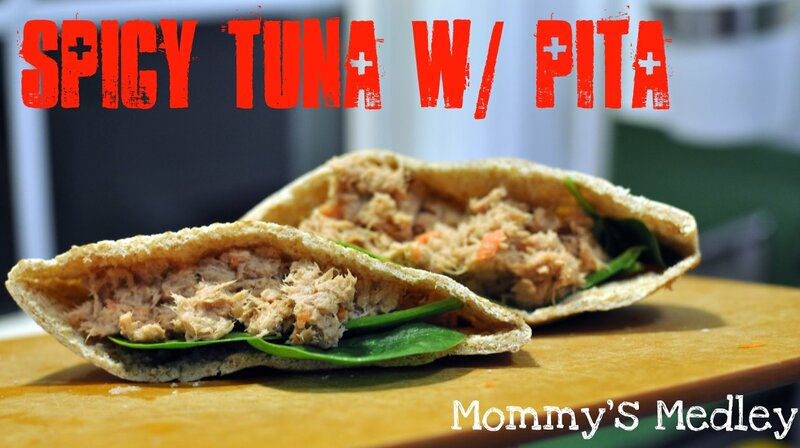 It is also a, ‘What do I have in the pantry, fridge and freezer meal?’ I took plain old tuna and dressed it up with some spices and citrus, added some shredded carrot, and put it in a pita pocket with spinach. The spices in this make me want to make tuna more often – I usually don’t opt for tuna because it is on the boring side. Spicy tuna was one of those duh moments for me – in this house we put spices on everything else, why not tuna? 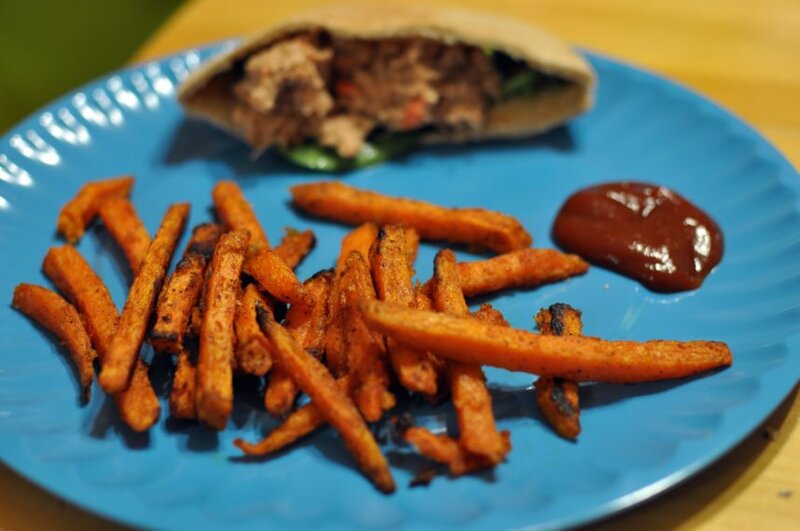 While I was leisurely making tuna salad I had some Alexia Sweet Potato Fries with Chipotle baking in the oven. These bad boys are so good. Who wants to make sweet potato fries when you can buy these? 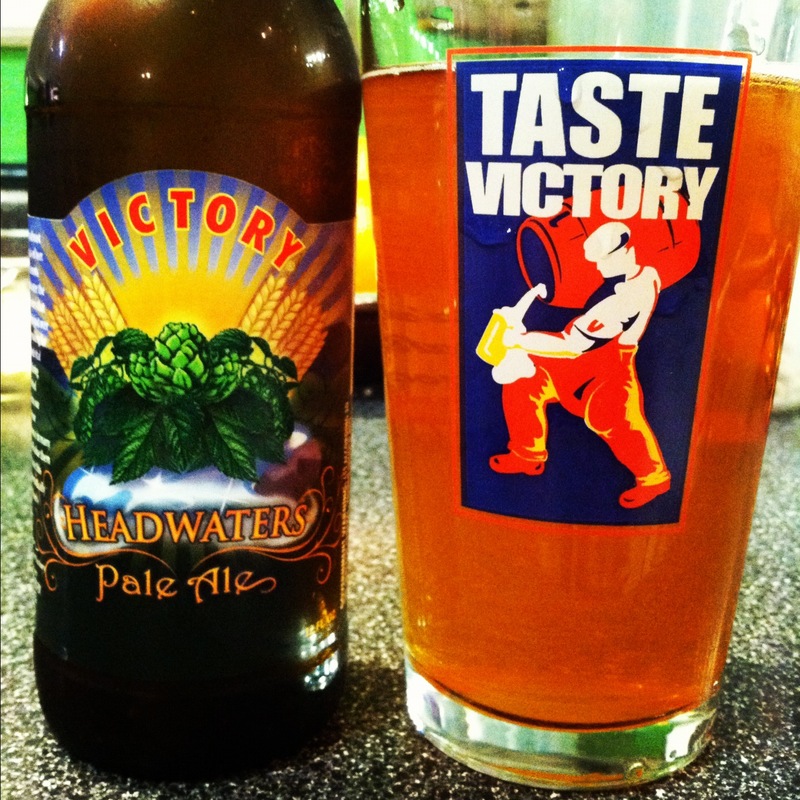 To top off this leisurely evening, Victory was having a beer tasting night at Bestway. Free pint glass with a purchase! Follow Bestway on Facebook, Twitter, or Instagram to keep up on these and other happenings at Bestway Grocery. In other news, we were out of school 3 hours early today due to sleet. The kicker though? They called this last night before any sign of weather actually fell from the sky and we are expected to get maybe an inch last time I checked. This means the grocery store bread and milk racks are empty right now. Can anyone from the South explain to me why this is the biggest need during a snow storm? Ah well, more time at home with my sick baby. 1. Mix 1 pouch of tuna (or can) with 2 to 3 tablespoons mayo and 4 shredded baby carrots (or 1 small carrot). Add 1 teaspoon chili powder, 1-1/2 teaspoons ground cumin, 1 teaspoon ground pepper, and 1 to 2 teaspoons lemon or lime juice. Mix well. 2. Spread into pita, top with fresh spinach. This meal is so bright, so delicious, so easy, so filling, and so not a meat dish. I used the Gardein Beefless tips for this normally beefy stir fry. However, this will be my last meat substitute for a while here. I have been doing much reading on the vegan meat substitute industry and I am no longer sold that is is necessarily the best way to go meatless. Here is one such article on the state of quinoa and how the Westerner’s taste for this grain is driving prices through the roof and destroying the nutrition of Bolivians. I am guilty of adding to this problem and know that eating locally grown and raised foods is a much smarter option in terms of the environment, and this meal is far from locally grown! This has been heavy on my conscience – I feel better after venting a bit. Usually Eric makes the stir fry dishes, so I actually snagged this one from an old issue of Every Day Foods. It was nice and simple to follow. I guess the thing that always snags me about stir fry dishes is the sauce. How much is too much and how much is too little? Those bottles of pre-made sauce are just too easy… This sauce was easy though – orange juice, rice vinegar, soy sauce, and brown sugar. Honestly, I would leave out the sugar next time, but I am not big on sugary stir-fries. 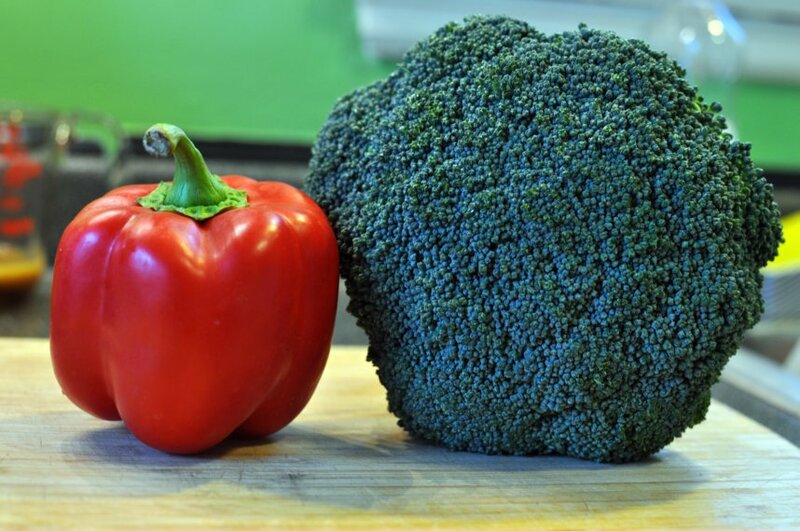 The veggies are two of my favorites – red bell peppers and broccoli. The only hassle about this dish is worth the hassle – cook the broccoli until green but still crisp. 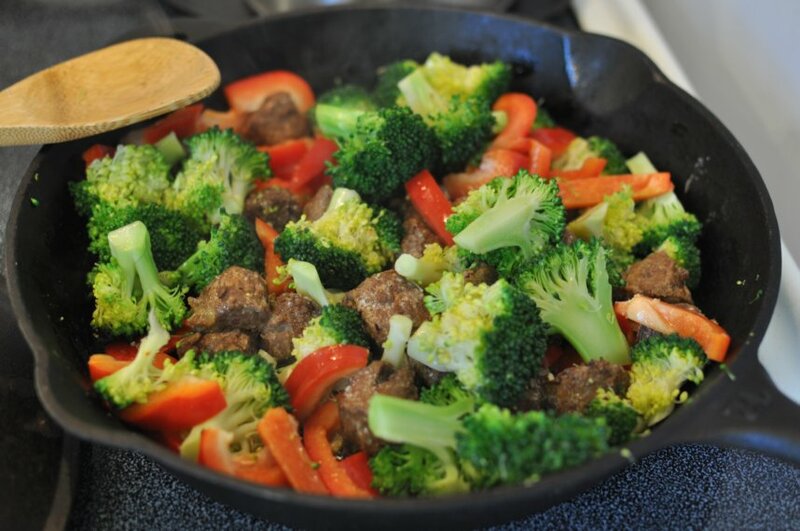 Remove it from the pan, cook the rest of the items, and return – this way your broccoli does not turn into a gray, mushy mess. I added red pepper flakes and Sriracha sauce for the 5 star flavor. It made a large amount of food – at least 4 servings and was excellent reheated. I ate it today for lunch while I was home again with sick Greta. Poor girl has pneumonia now, but a trip to the doctor and the pharmacy hopefully will kick this sickness quickly. 1. Cook 1 cup of long-grain rice according to the package. Set aside. 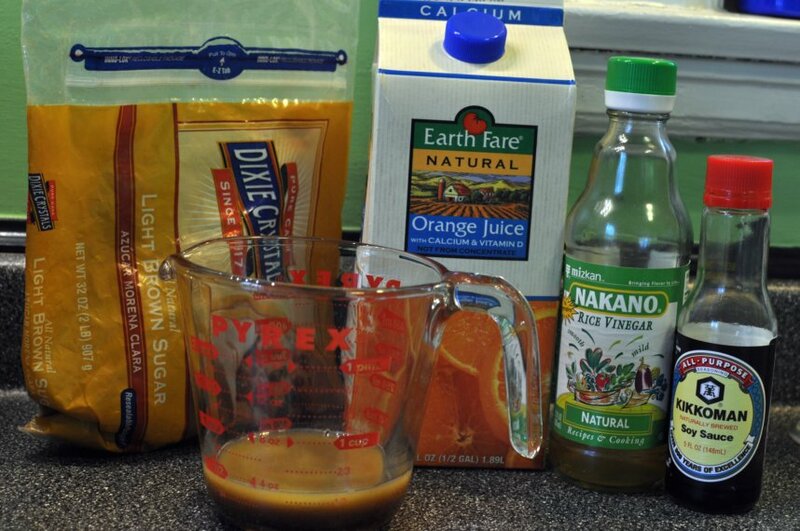 Meanwhile, in a small bowl, combine 1/4 cup orange juice, 1 tablespoon rice vinegar, 1 tablespoon soy sauce, and 1 tablespoon light-brown sugar. Set aside. 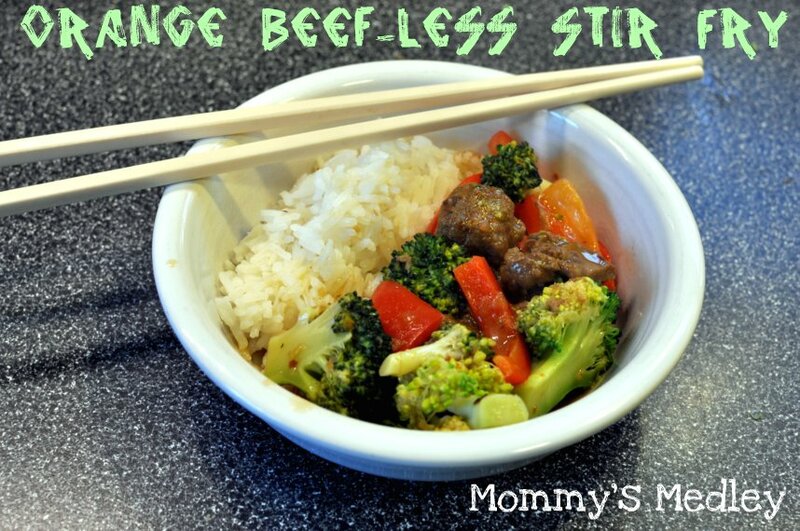 In a medium bowl, toss 1 pound (top or bottom round steak, cut into strips, 2 inches long and 1/4 inch thick) beef (or 1 bag Gardein beefless tips) with 1 tablespoon cornstarch. Season with red pepper flakes or ground pepper. Set aside. 2. 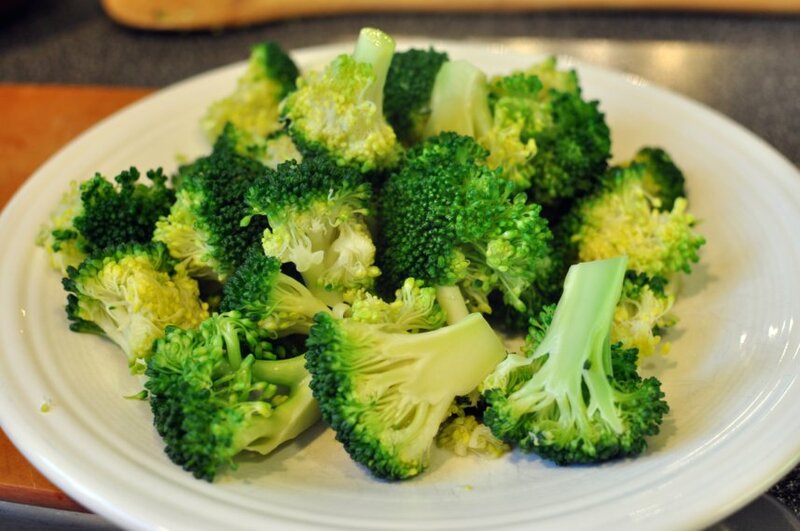 In a large skillet, combine 1 bunch broccoli, florets broken with 1 cup water. Bring to boil over medium-high. 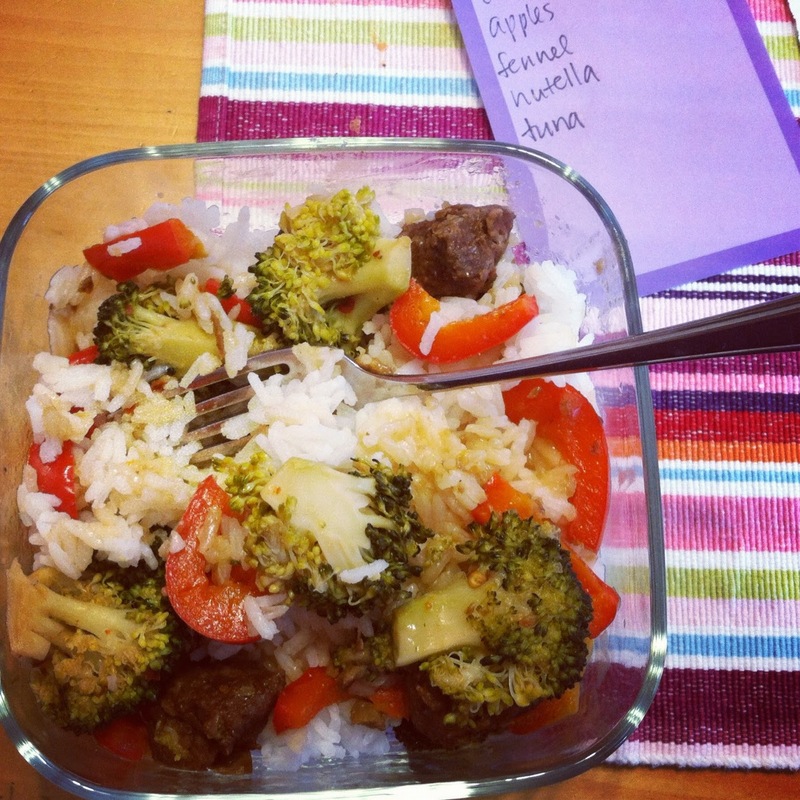 Cook partially covered until broccoli is green and crisp-tender, 4 to 6 minutes. Transfer to another dish. Discard water and wipe skillet dry. 3. In same skillet, heat 1 tablespoon vegetable or wok oil over high. When pan is very hot, add half the beef; cook until browned, 2 to 4 minutes. Using slotted spoon, transfer to plate with broccoli. Repeat with remaining beef but leave beef in skillet. If using Gardein beefless tips, cook entire bag until thawed, stirring frequently, about 4 minutes. 4. Return reserved broccoli mixture to skillet; add orange juice mixture and 1 red bell pepper, cut into strips (with seeds and ribs removed). Continue to cook over high heat until sauce thickens, 2 to 4 minutes. Serve over rice. I am home with a sick Greta today. She woke up in the middle of the night with a fever, so I ran in to school, put together some sub plans, switched with Eric, and came home to a runny nose, feverish, whimpering and hand-pumping toddler. Greta uses a mixture of baby sign language and American Sign Language to communicate her needs. She pumps her hand like she is milking a cow and says, “Peez,” when she wants milk. I am telling you, baby sign language is one of the best things we ever did for our daughter and I recommend that EVERYONE use this communication tool. For the most part, it has prevented meltdowns over the simple things. So back to her being sick, she still has an appetite but keeps asking for milk, and due to past experiences, I wanted to avoid dairy until her fever subsides. I made this smoothie because it is filling, simple, not sugary, and would hopefully interest her until she forgot about her repeated requests for milk. I chose frozen berries and peaches because they are two of Greta’s current favorites. I threw in some spinach as hidden greens. 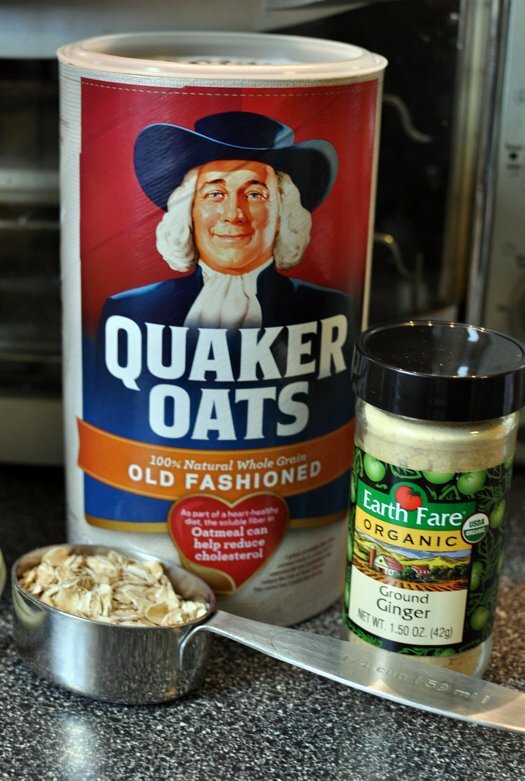 The oats were added for a little filling grain and the ginger for flavor and to prevent a possibly unhappy tummy. I blended the fruits, spinach, ginger, and oats together with almond milk and orange juice. 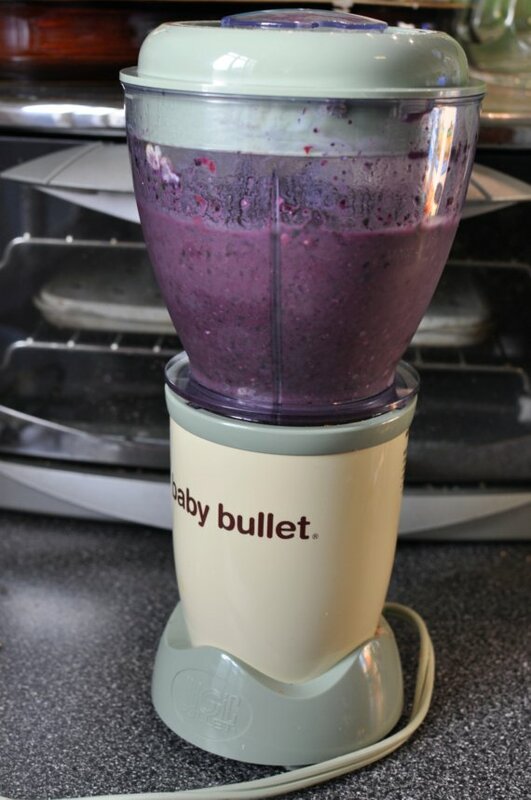 I am still loving my Baby Bullet and still recommend it to all parents – it doubles as a great compact blender when you are done making baby food purees. Greta has a cough right now too, so I added in some honey for sweetness and to slow down her coughing. One of the nurses at her doctor’s offices told me to use honey, not cough syrup for her cough. Children below 1 year should never be given honey due to the risk of botulism, a serious form of food poisoning. 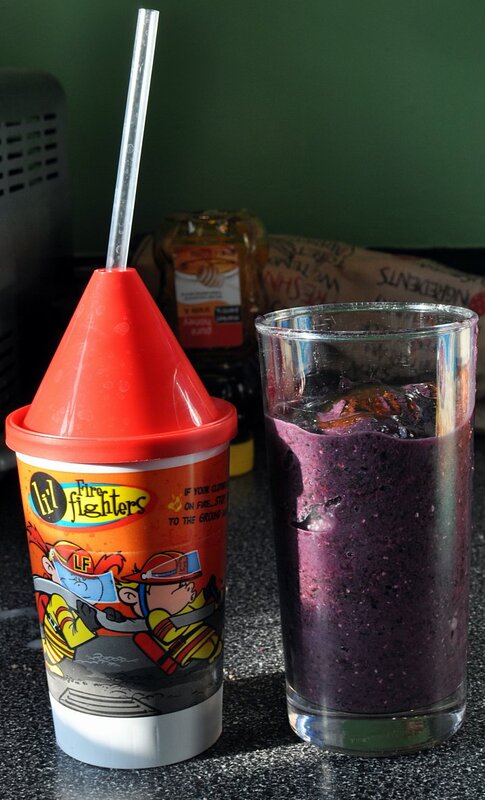 The finished product – Greta’s fire fighter cup, or in this case, germ busting smoothie cup and my breakfast smoothie. She loved it and I think it distracted her from her milk hankering. I’m off to find a bagel before she wakes from her nap. 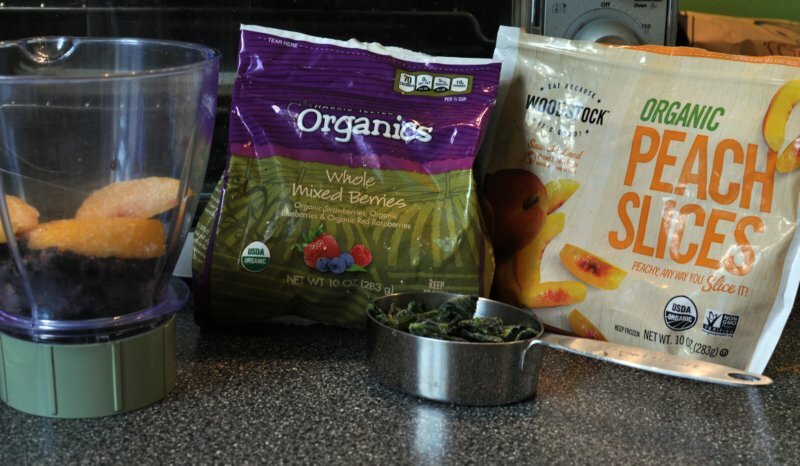 Smoothies never hold me over for very long. 1. 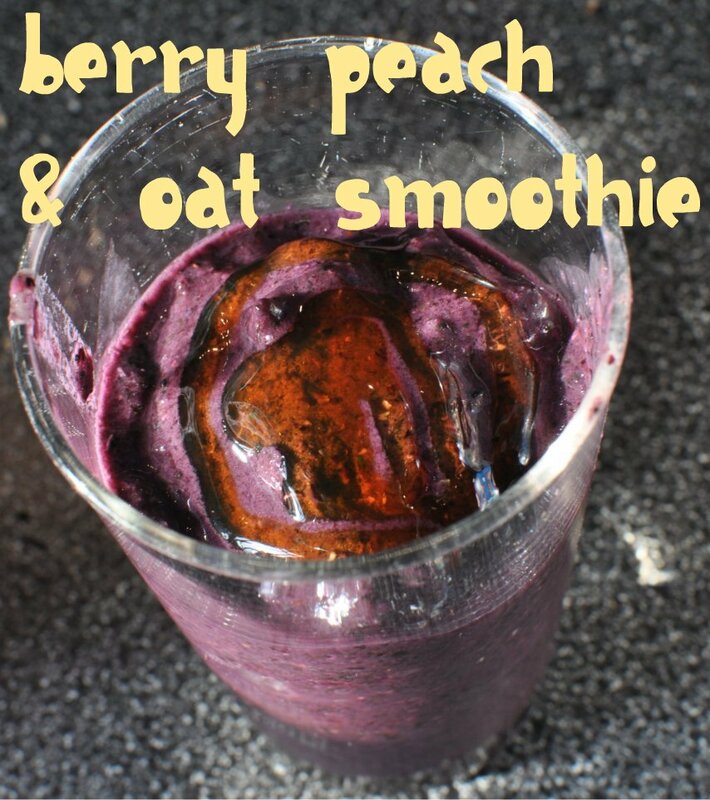 In a blender, combine 1 cup frozen mixed berries, 4 – 5 frozen peach slices, 1/2 cup frozen spinach, 1/4 cup oats, a sprinkling of ginger, 1 cup almond milk, and a splash or two of orange juice to help blend. 2. Blend until smooth and free of lumps. Garnish with a drizzle of honey. I whipped this meal up in a total of a whopping 20 minutes this evening. We made a quick run to the grocery store to stock up for the week and then of course needed something quick like and in a hurry to fill the hungry bellies. 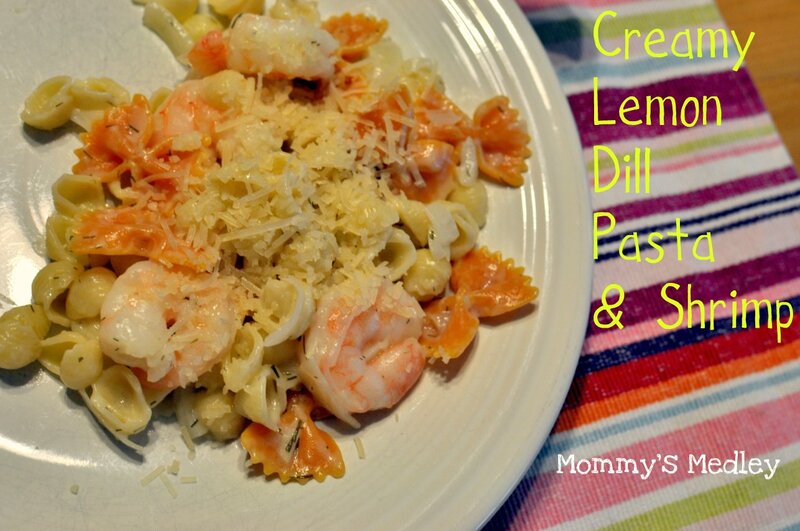 The flavor for this dish comes from two complementary sources: dill and lemon. I am not usually one to like cream sauces, due to the dairy. This dish was light and dairy-free by swapping milk and butter for almond milk and margarine. I used up the pasta in my pantry and combined two boxes. Be careful though – you may end up with two different cooking times. The combination of these two was really good. The veggie pasta is a nice way to get another serving of veggies. I added the shrimp to the pasta water at the end of the cooking time. After all, efficiency is just smart laziness. I love it when the food I eat is bright and colorful, as well as tasty. 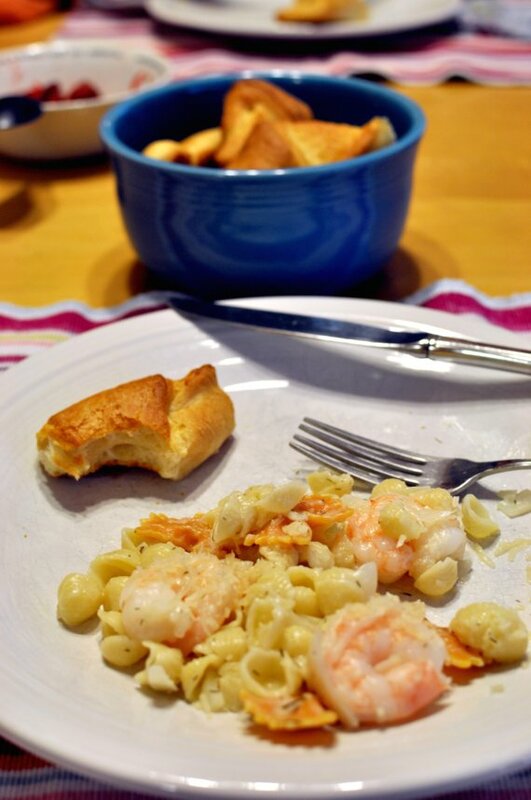 We had our pasta with more of those delicious Immaculate Baking Crescent Rolls. If you have not tried them yet, you really ought to. Let me know what you think. We have plenty of leftovers for lunches this week. I love starting a work week off with food prepped and ready. I am a true Midwestern with my need to squirrel away supplies, I guess. Enjoy your week! 1. 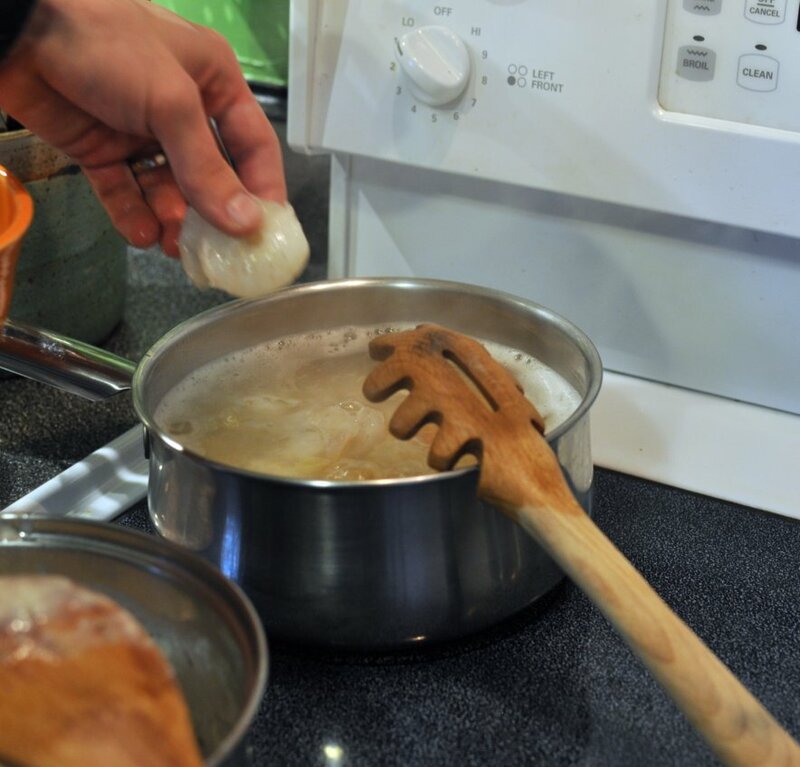 In a large saucepan, bring water to boil for pasta. 2. In a small saucepan, melt 2 to 3 tablespoons margarine or butter. Saute 1 small yellow onion, diced until soft. Add 1 cup (almond) milk and bring to low boil. Add 1 tablespoon flour and whisk until smooth. 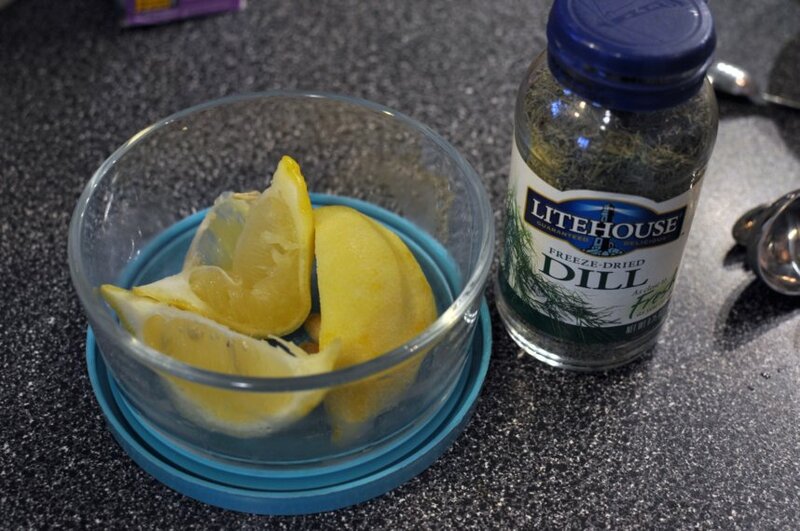 Stir in the juice from 2 to 3 lemon wedges, 1/2 teaspoon dill and fresh ground pepper. I used freeze-dried dill, and equal proportions to using fresh dill. Cook on low heat until thickened. 3. 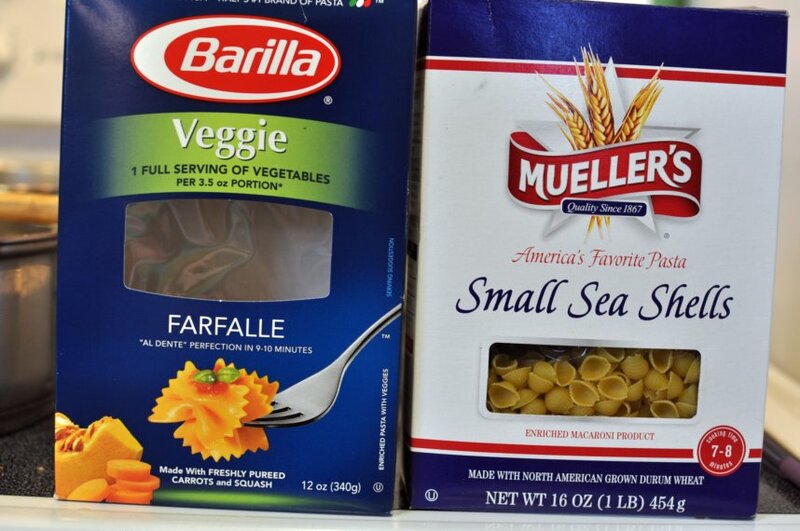 Meanwhile, cook pasta according to directions. During the last 3 minutes of cooking, add 15 to 20 thawed, raw, de-veined shrimp. Cook until shrimp are pink and opaque. 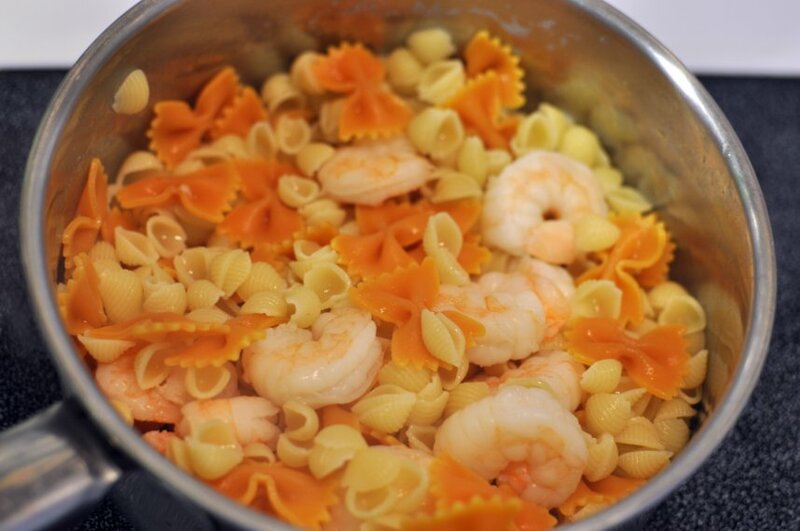 Drain pasta and shrimp mixture. 4. Mix together shrimp and sauce mixture. Optional topping: serve with shredded Parmesan cheese. 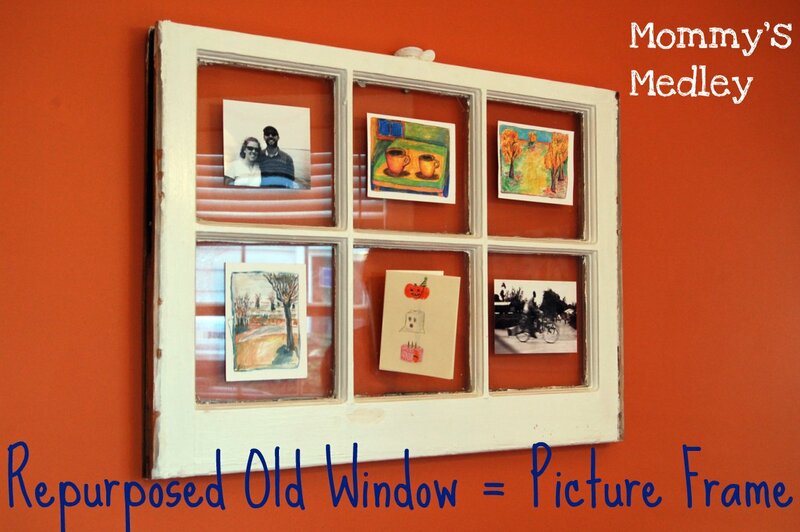 This is a simple project I put together this weekend using items around the house, my craft room, and the garage. It is a big hit with Greta, such a big hit, I was working on it while she was playing with it a few times. This project came about on Thursday evening as it was starting to snow. 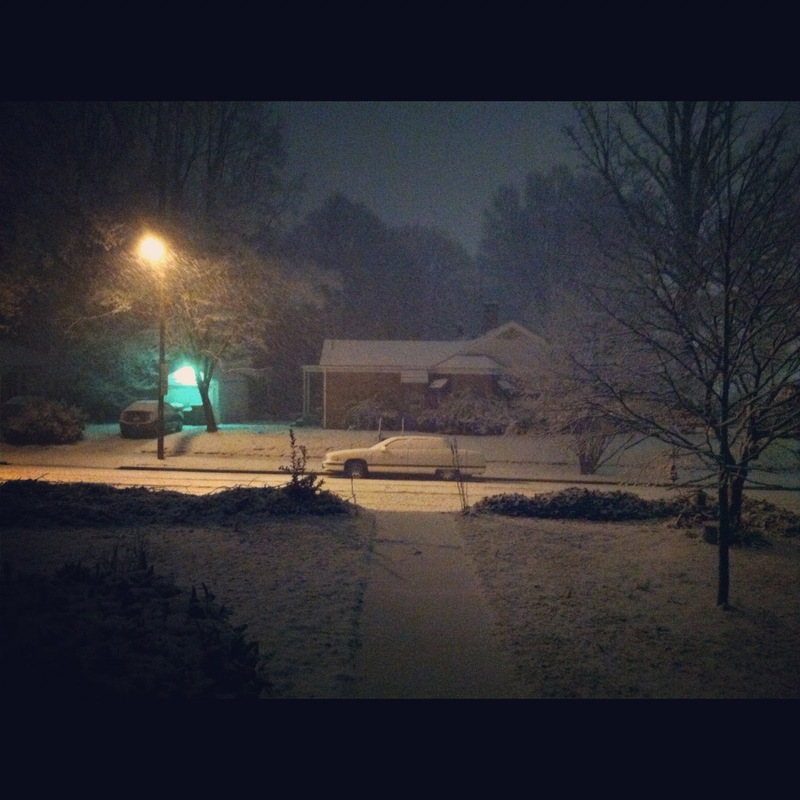 Snow in North Carolina incites riots. Grocery stores lose entire bread and milk supplies, people rush out to buy sleds, shovels, salt, and cold weather clothing. Schools cancel activities with the mere mention of possible snow. Day cares, preschools, public schools, churches, and businesses alike, close with the actual act of falling snow. Pure insanity, I tell you. Anyway, while waiting for the inevitable phone call that school would be canceled on Friday, Greta and I played with her snowman. The snowman was completely her choice, might I add. 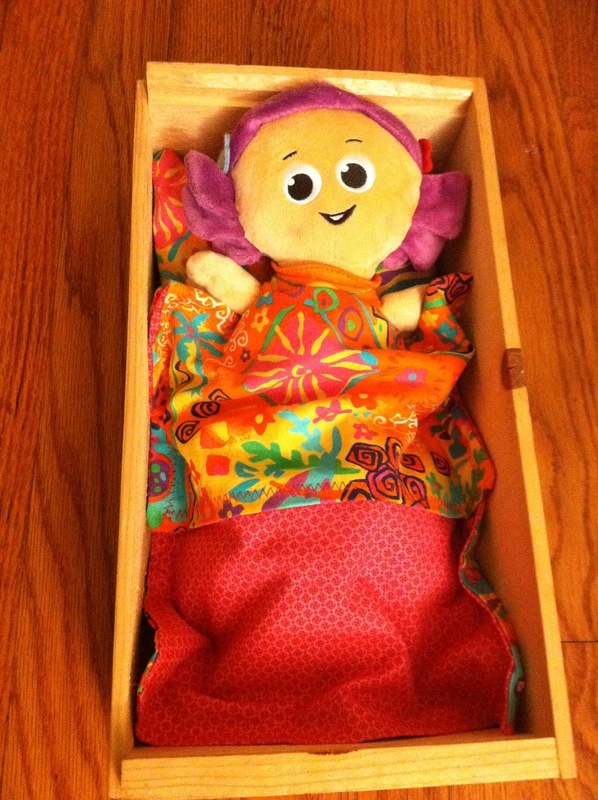 She discovered that it fit into an old wine box that had formerly been storing items by the front door. She proceeded to wrap it up and put it bed over and over again. 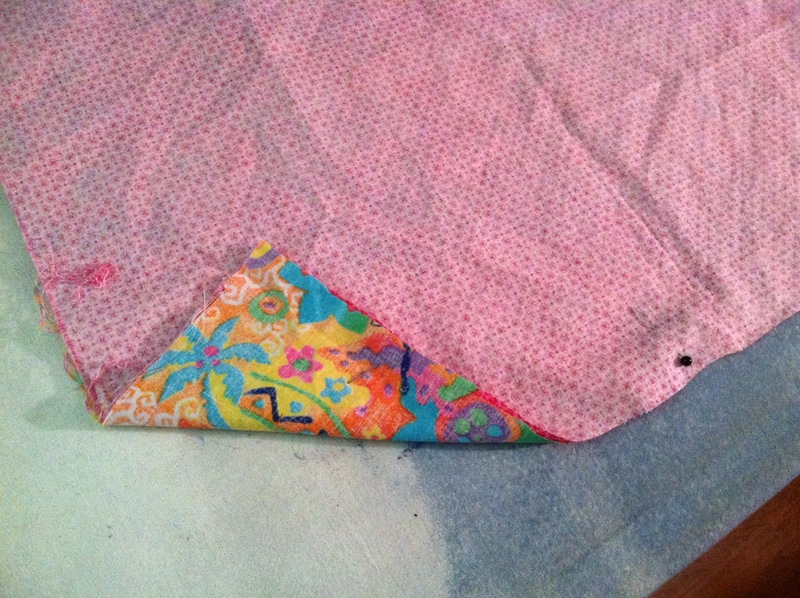 I quickly ran back to my sewing machine and turned out a small stuffed pillow as a mattress and a reversible blanket. This cute tropical print fabric came from my mom a couple years ago. The bright print is full of things Greta loves – frogs, lizards, flowers, and graphic shapes. 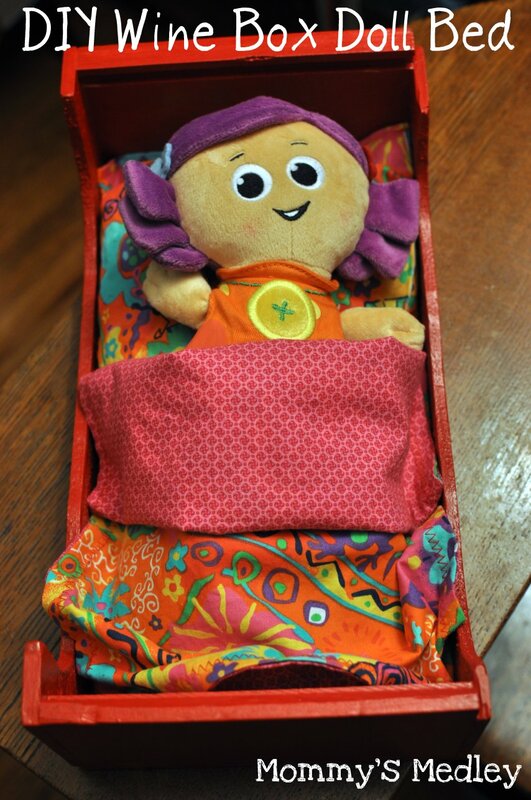 Now her doll and stuffed animals had a place to sleep. I soon realized she was becoming frustrated with the tall sides of the bed. It was too difficult for her to line up the mattress and tuck in the blanket just the way she wanted. You see, I have a Type A on my hands. So, to thwart the frustration noises and angry throwing, I had to act quickly. Out to the garage we went. Using a small hand saw, I cut the sides down so the box resembled a sleigh bed. I had Eric demonstrate it for this photo, but I promise, I cut the sides myself. You can see my uneven cutting skills in this photo. 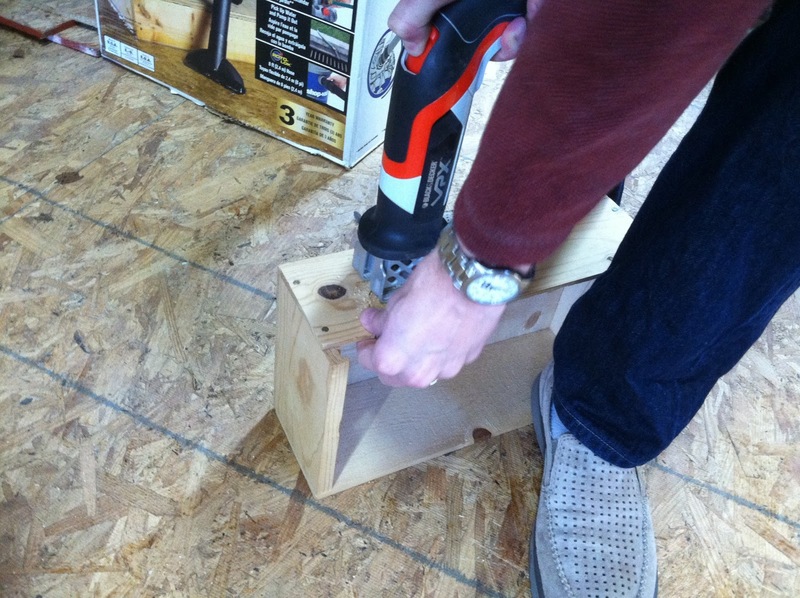 I ran a small amount of wood glue along the inside seams to strengthen the box. 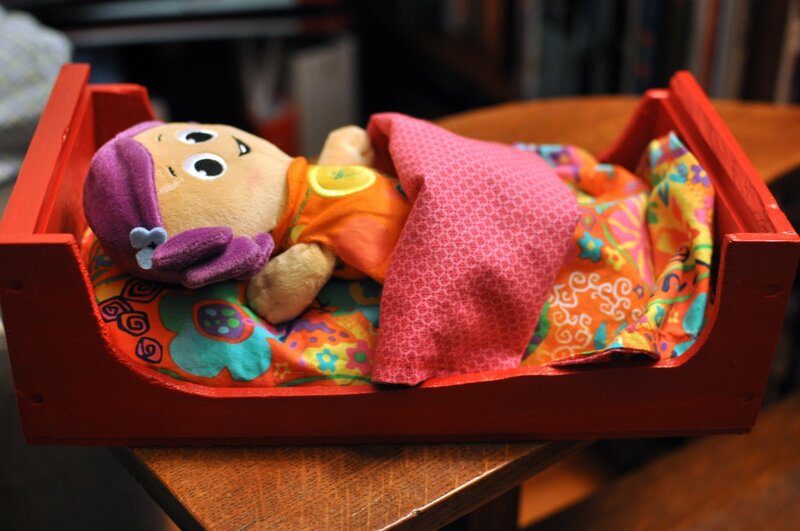 After Greta was in bed last night, I painted the bed a bright shade of red. 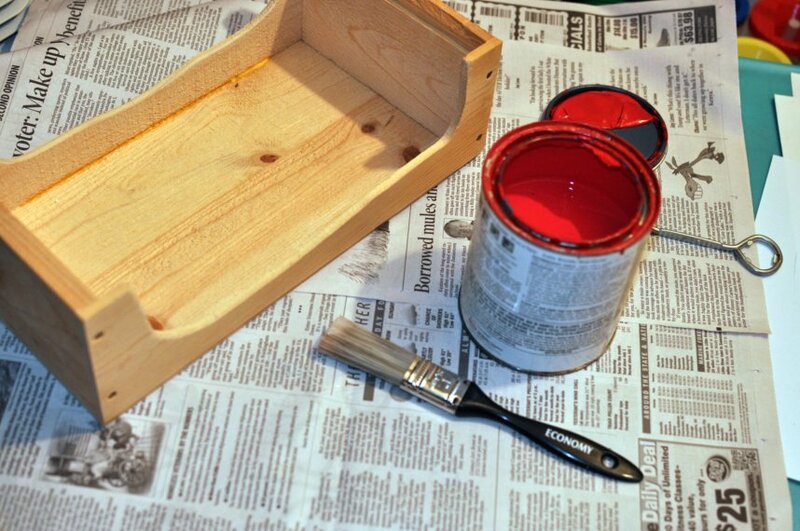 Two coats of paint later, and the bed was proper. 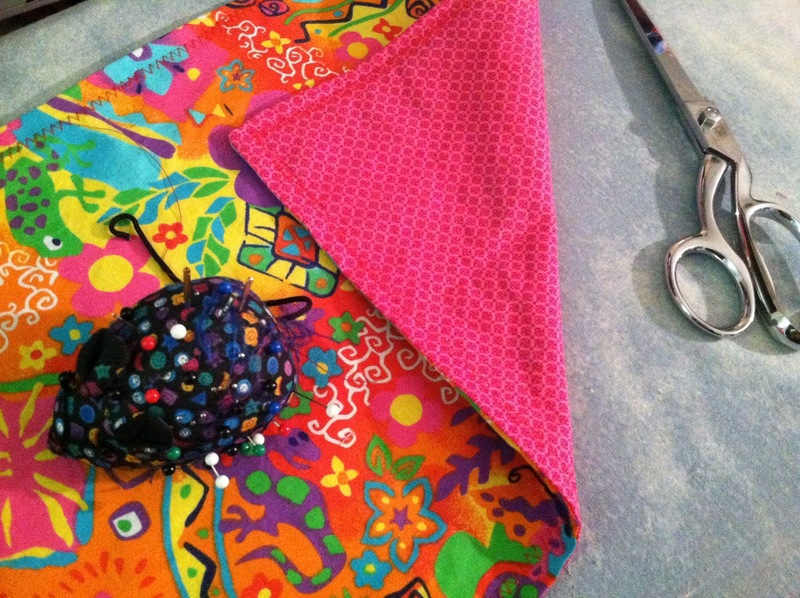 The bright colors complement each other nicely without being gaggingly pink, don’t you think? 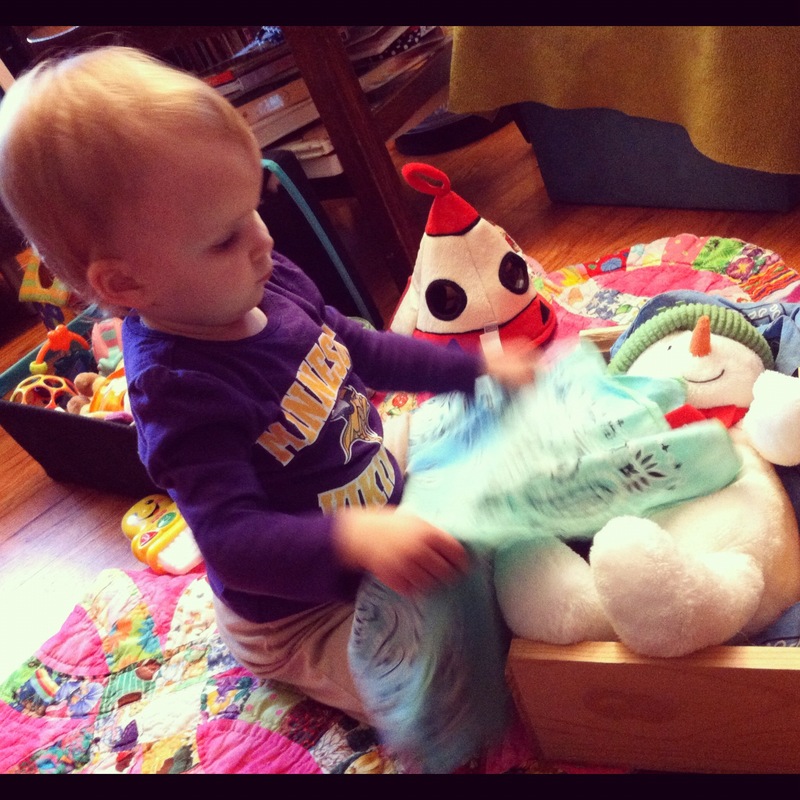 Greta gave it her approval by promptly putting her doll to bed. And because it is Sunday, you know what that means, here is my English connection for the week. Scones! Although, I feel like I was cheating making these this morning, they were the perfect start to the day. 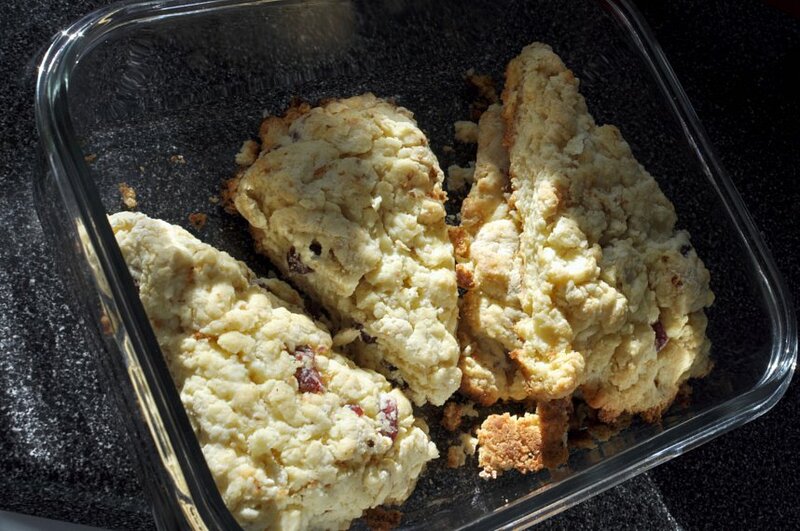 We were all up at 6:30 AM and these cranberry orange scones only took 20 minutes from start to plate. The reason I felt like I was cheating? 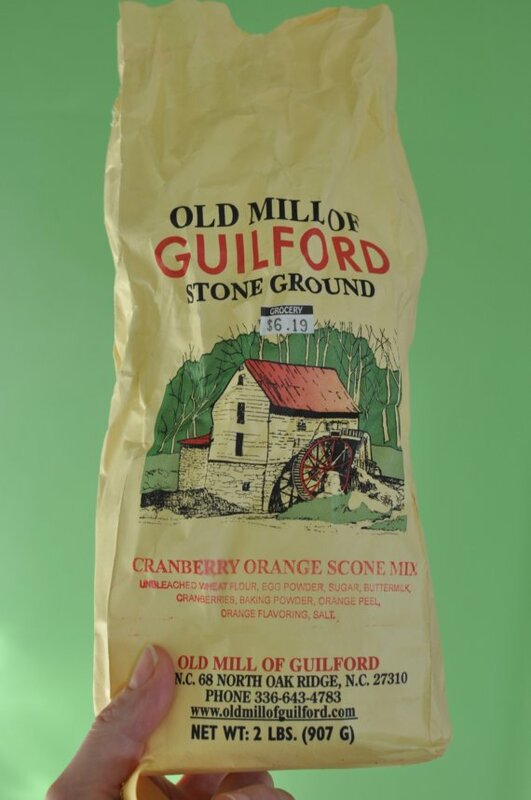 Old Mill of Guilford cranberry orange scone mix. There are some great stores in town where you can purchase these mixes. The best location is the mill itself, otherwise try Bestway. Bestway is an excellent stop for purchasing a number of things, which you shall see if you go to their Facebook page. As simple as the ingredients and the directions are – you can’t go wrong. 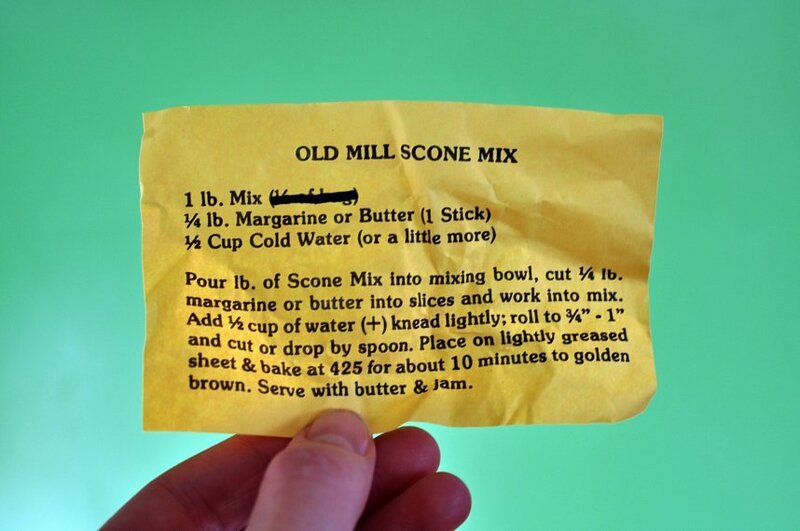 Maybe next week I will bring out the Blue Ribbon Winning Scones from the my 4H days. 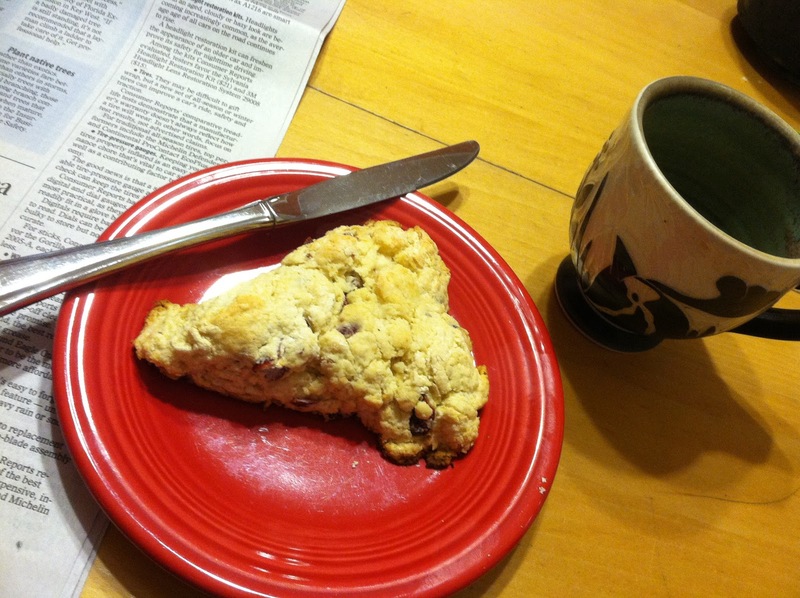 But for now, I will savor my 20 minute scones. It snowed here last night. Not the pretty, fluffy, dry snow that I love so dearly. The wet, drippy, mushy, messy snow. School was canceled, leaving us with a day to do errands, leisurely enjoy the day, work on some projects, and day dream of the contrasting weather. 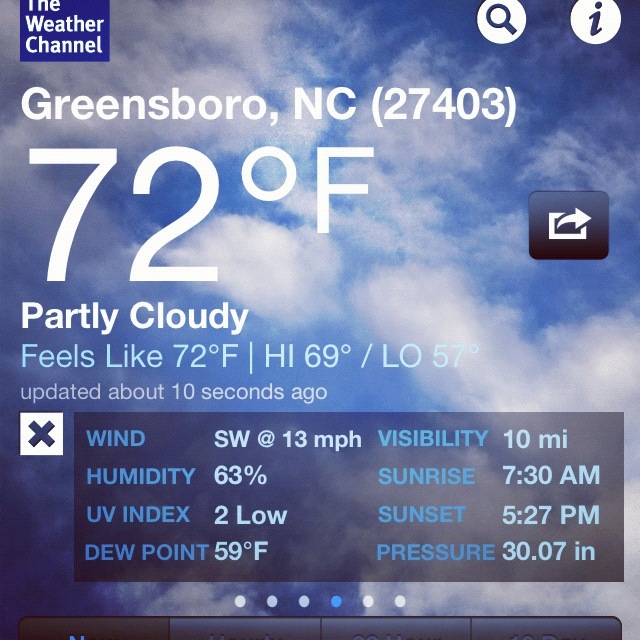 Remember that lovely 73 degree weather last weekend? Yeah, ate my words. 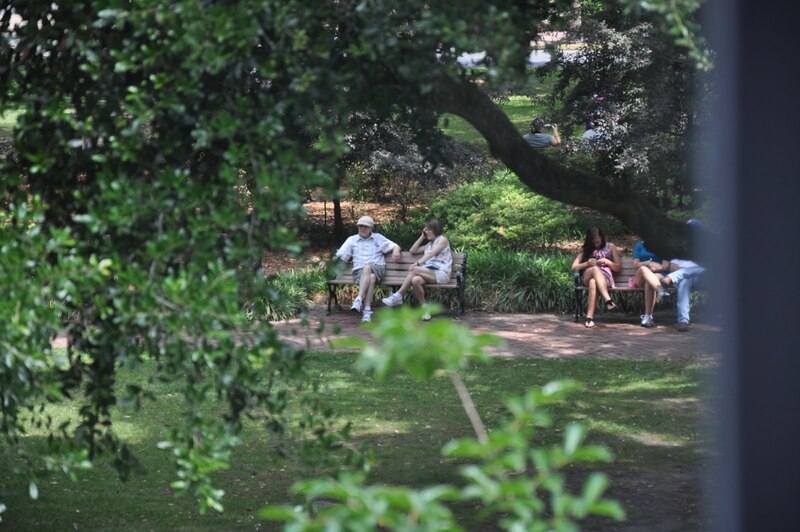 I was daydreaming of Savannah this afternoon. 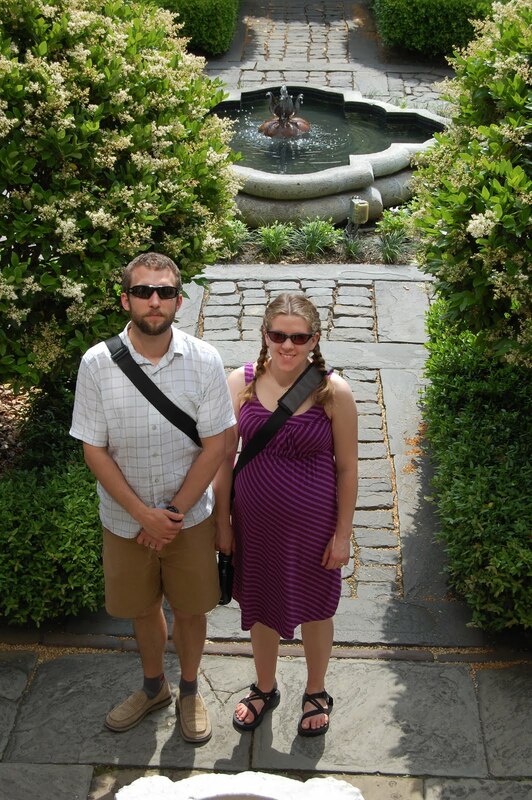 We were there in April of 2011 – the last trip before Greta arrived. Below are some highlights from that trip. 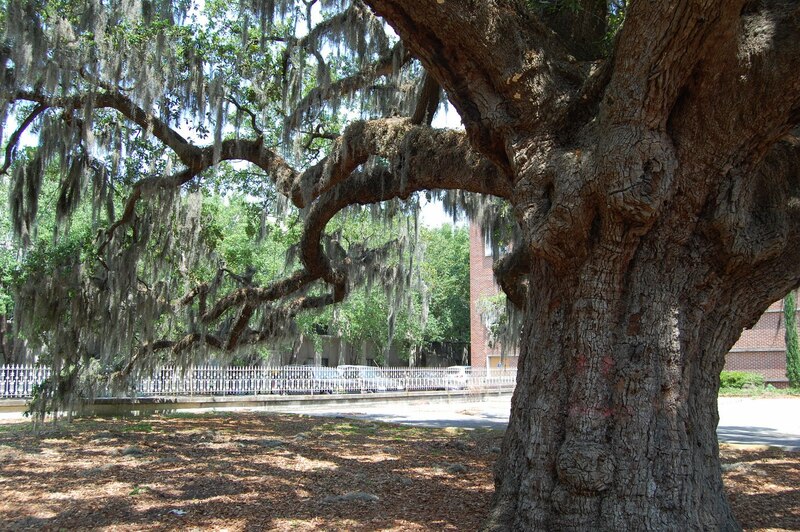 Live oaks. Need I say more? 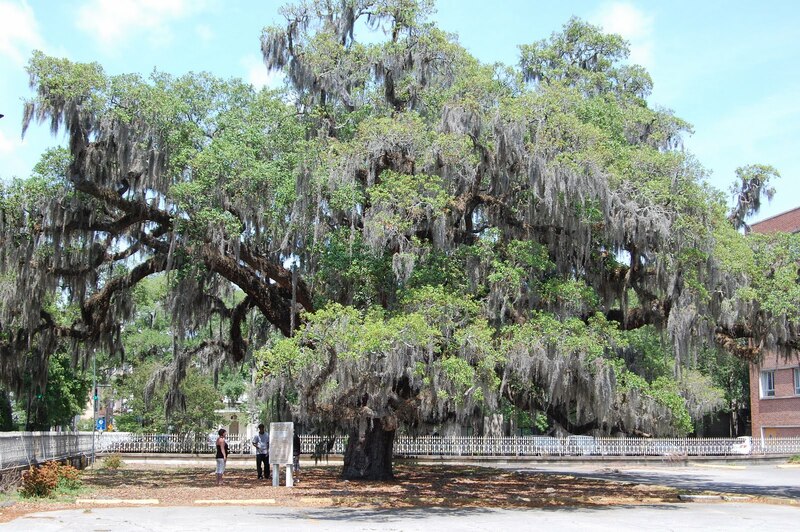 This live oak is called the Candler Oak. Yes, I told you I was pregnant. We met my parents in Savannah, a place none of us had ever been before. 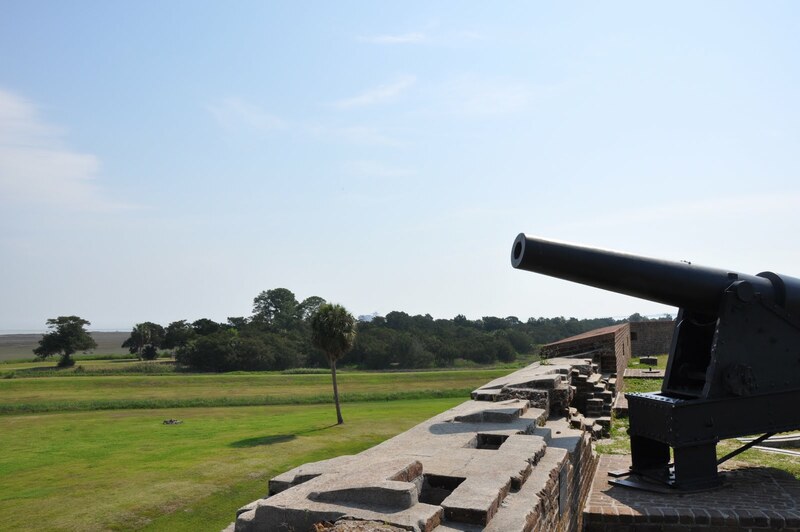 One of the places we made sure to visit was Fort Pulaski, just 15 miles east of Savannah. 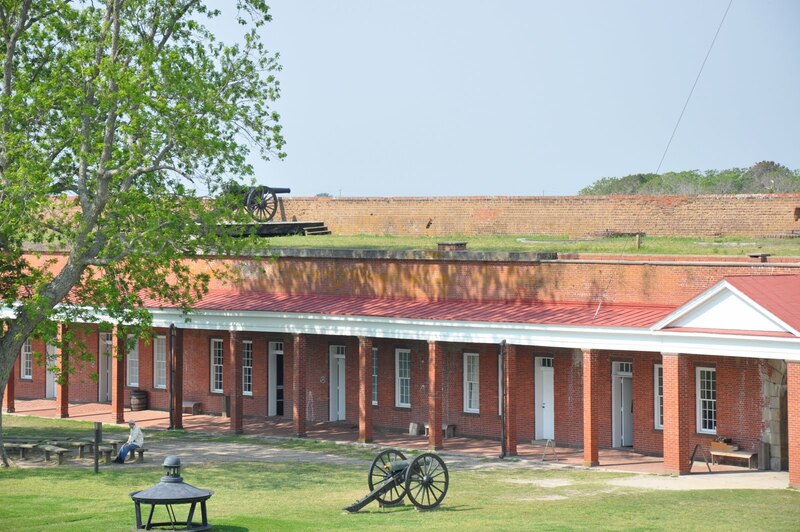 This site is historical not only for its role in the Civil War, but also because the Union Army used rifled canon against the Confederates holed up inside, forcing them to surrender. We happened to be there during National Parks Week, which allowed us free entrance. This year’s National Park Week is April 22 – 26. As always, when traveling, I am constantly learning. I love living in the South and being able to soak up the abundant history. 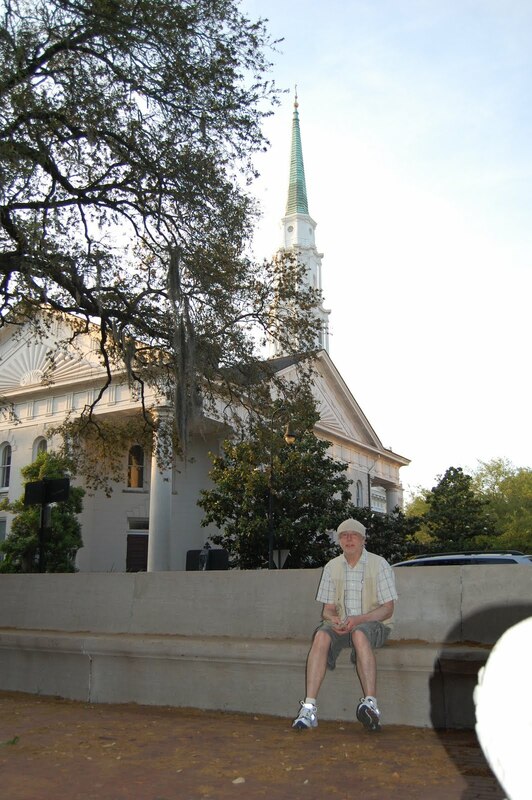 This trip was no different – I learned of the important role that Savannah played in the Civil War. On December 22, 1864, Union General William T. Sherman captured the city of Savannah after his famous march to the sea. This had been one of the last major ports that had been in use by the Confederate army. Sherman’s army left a wide path of destruction in their wake in order to bring suffering to the South, in hopes of ending the war quickly, however Savannah was left largely untouched. Sherman sent word to President Lincoln, “I beg to present to you, as a Christmas gift, the city of Savannah, with 150 heavy guns, and plenty of ammunition, and also about 25, 000 bales of cotton. 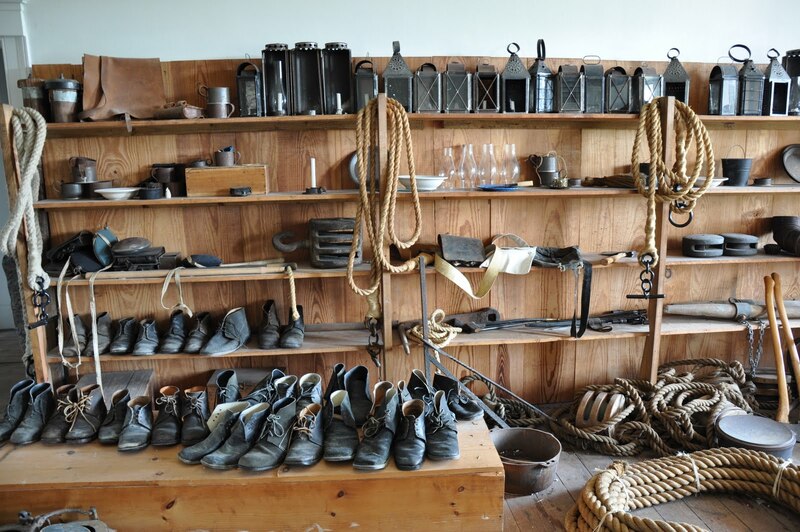 There were plenty of Civil War era supplies to look at. The views of the surrounding marshlands were impressive from the fort. View into the fort from the top. We also made a point to visit the Savannah National Wildlife Refuge, which is actually in South Carolina. The refuge has an interesting center with exhibits and a gift shop. There are trails that spiral out from there. 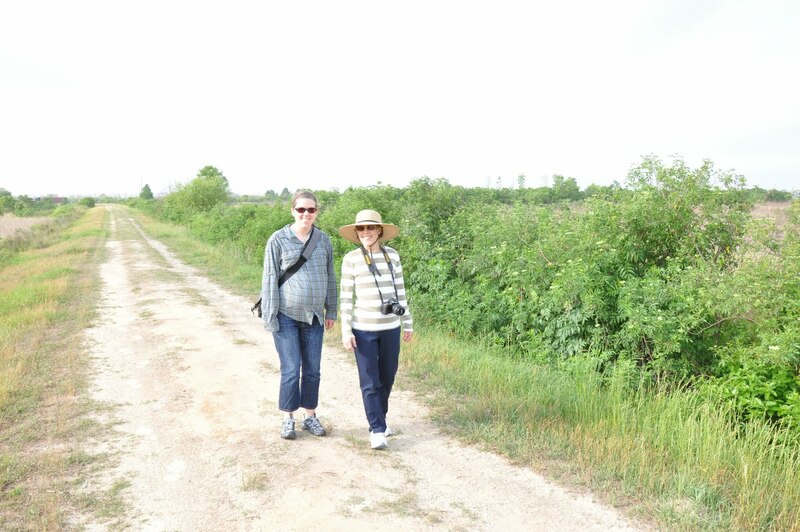 Or, you can drive to more rural sites and walk along dirt trails in hopes of spotting birds, alligators, and the likes. I do not recommend walking around with bare skin, especially if pregnant, you will be eating alive by mosquitoes. 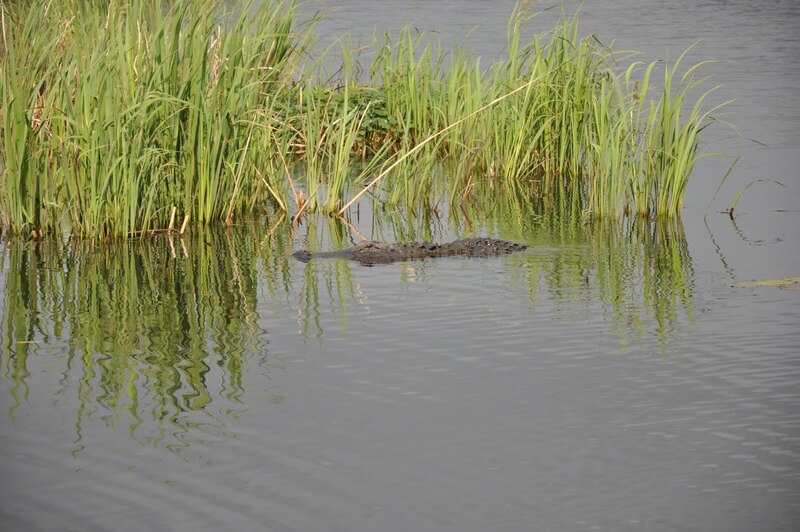 We were lucky enough to see an alligator. He leisurely swam around the marshy area for quite some time, allowing us ample time for quality photographs. This refuge was once a rice farm, but is now since been returned to a wild state. 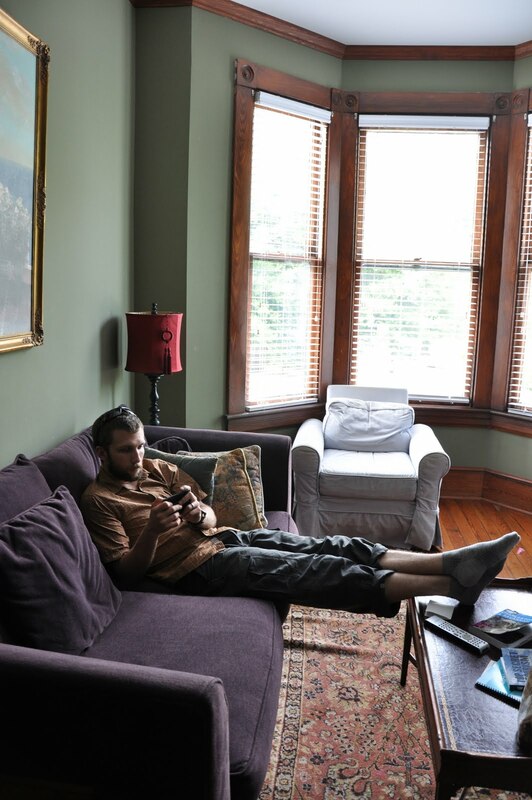 Back in Savannah, we stayed at a nice house, divided into three levels, called Suites on Lafayette. We enjoyed having the space to spread out. Eric brought his bike along. 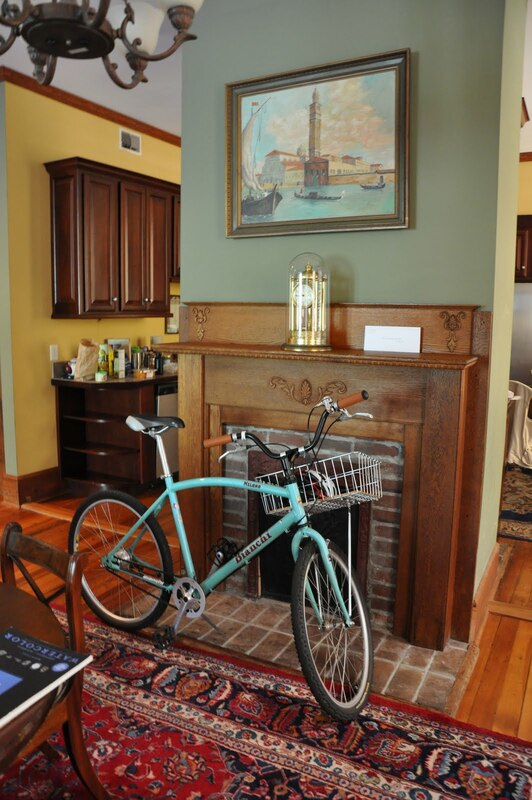 Savannah is a great place to bike – mostly flat with areas easily accessed by bicycle. Alas, I was a little past the biking point at this stage in pregnancy. It was nice that he was able to run to the store without risking losing his parking space. The house overlooked Lafayette Square. 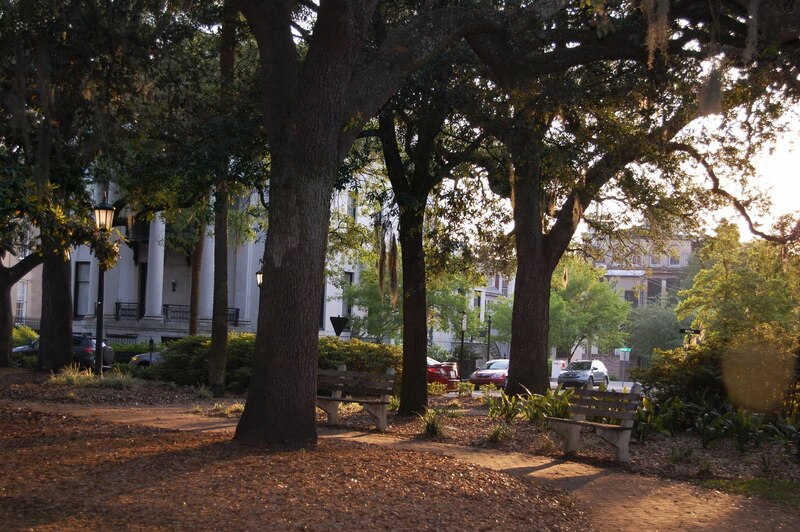 One of Savannah’s defining features are its numerous squares that help to distinguish each neighborhood surrounding it. 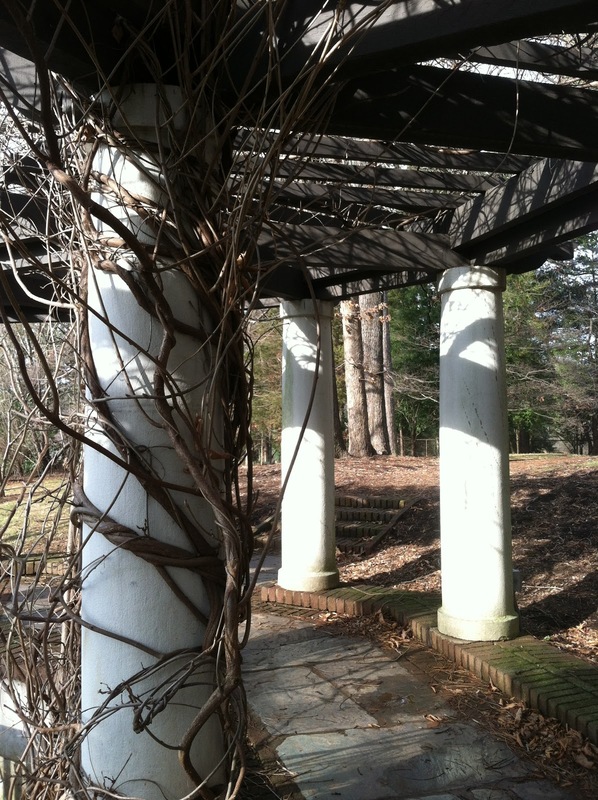 The back side of the Suites at Lafayette had wonderful covered porches covered in sweet-smelling jasmine. 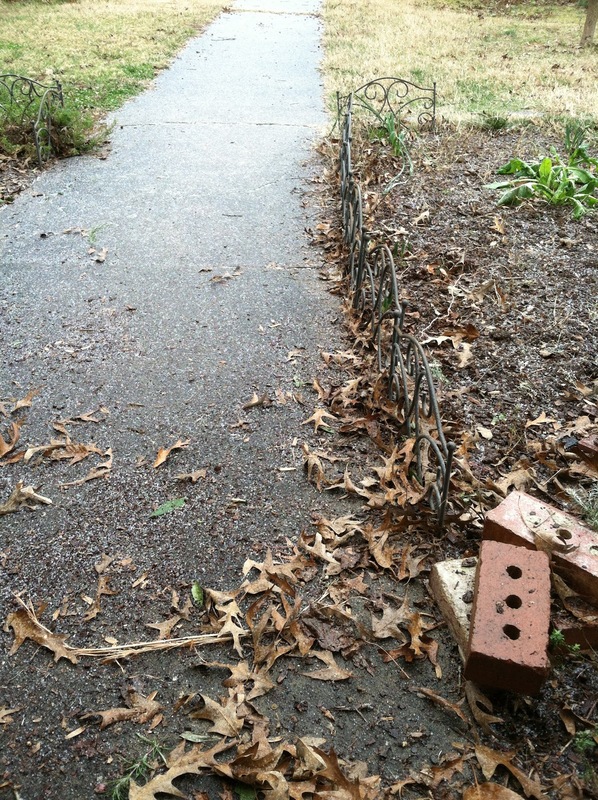 The porches overlooked the yard of the childhood home of Flannery O’Connor, the writer. 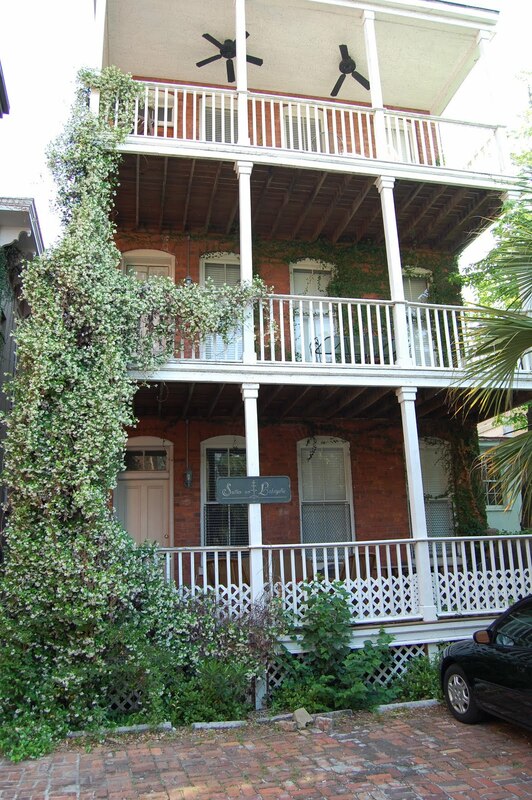 This is a view of the Hamilton-Turner Inn, kitty corner from the Suites at Lafayette. 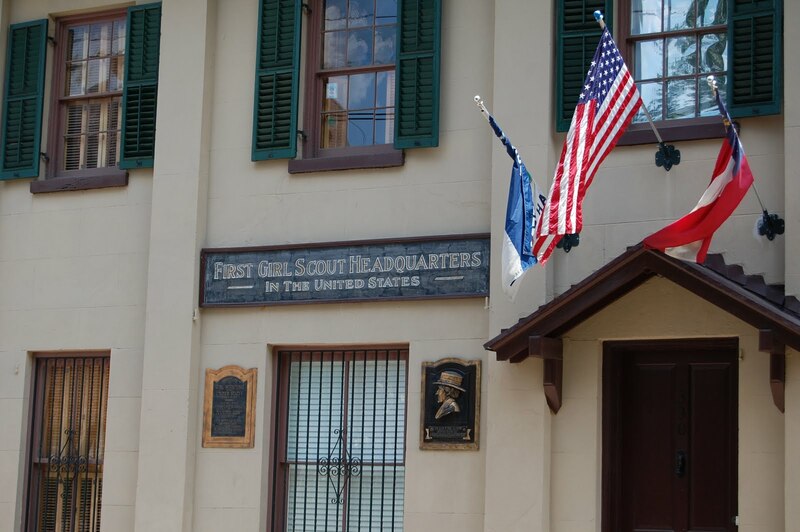 Savannah is always teeming with girls scouts – for good reason too. Of course we had to be gawkers and stroll by the Mercer House, known for its role in Midnight in the Garden of Good and Evil. 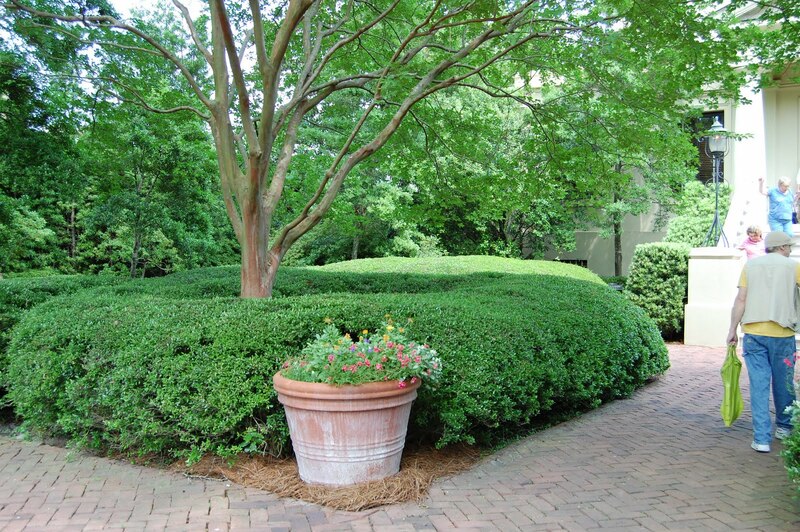 The Davenport House Museum was an interesting tour with lovely gardens as well. 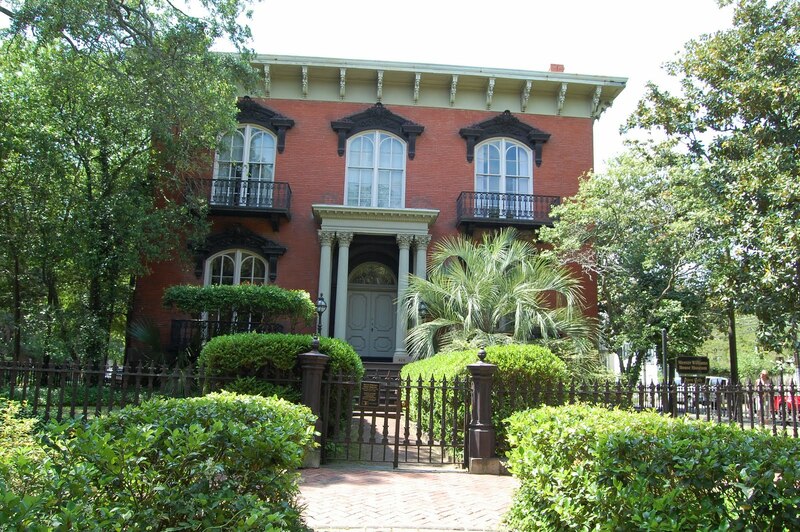 This home was completed in 1820 and marks the beginning of Savannah’s conservation of historic homes. Some of the highlights of this home are the oval dining room, the curving double front staircases entrance, and the woodwork on the grand staircase. 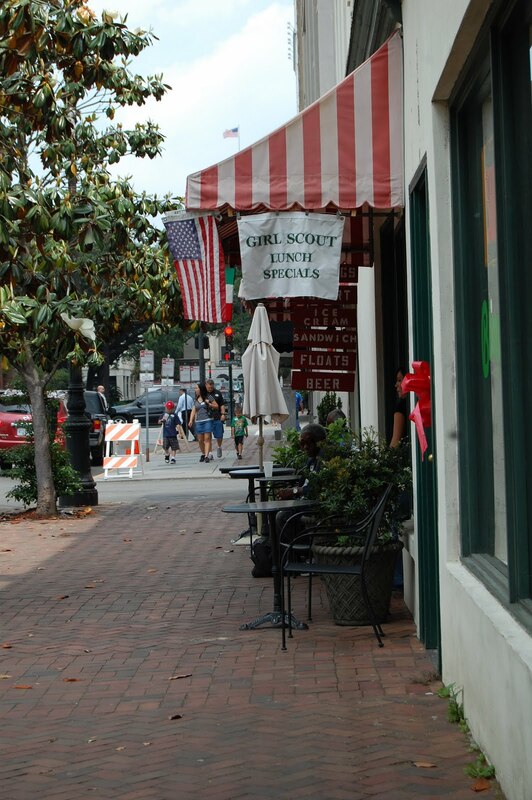 There are plenty of places to eat in Savannah. My pregnant self did not slow down to photograph any of the great places to dine. One place that stands out was the Firefly Cafe, however. They have a corn chowder with crab meat! 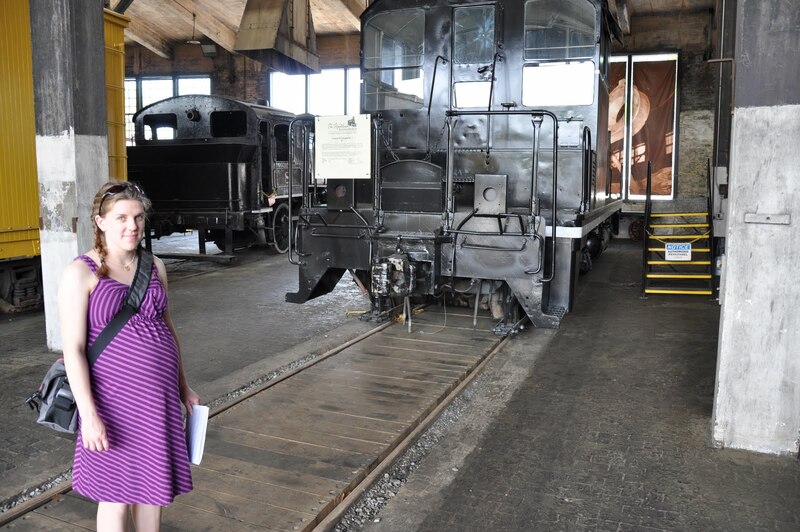 We appeased Eric’s interest in all things transportation and visited the Roundhouse Railroad Museum. 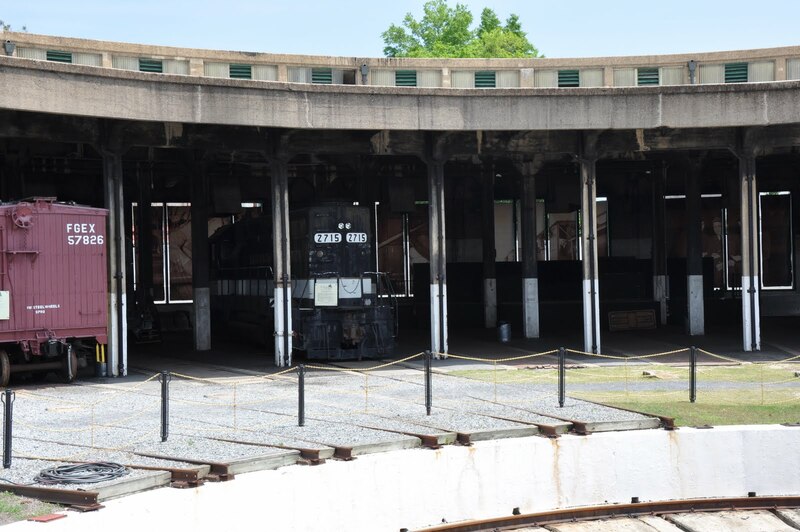 This is a large roundhouse that contains various examples of trains, engines, and other railroad memorabilia. Despite my expression, I really did enjoy this museum. It was just hot. Really hot. Did I mention I was pregnant? 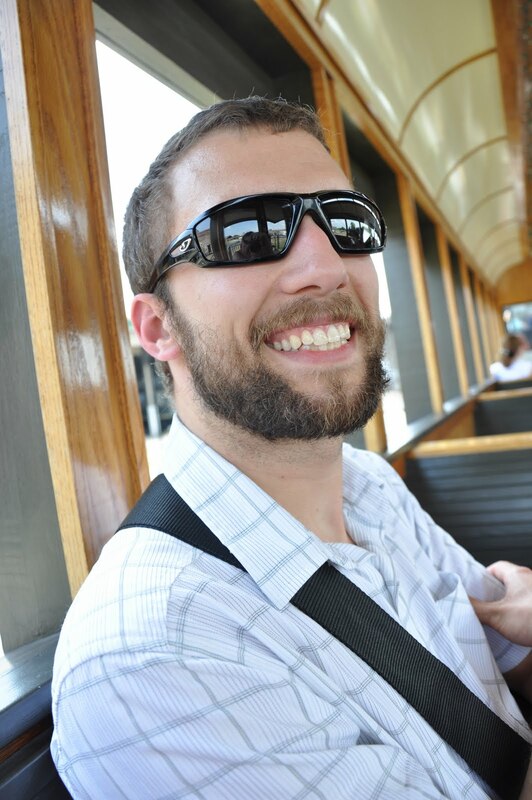 Eric was all grins when we went on an actual train ride. This train ride takes you on the roundhouse, which turns the train around on a track. See, we are spinning around the face the opposite direction here. Later, we took one of those hokey trolley tours. When you are pregnant, it is a good option. We got off to see the Forest Gump square, also known as Chippewa Square. That leaf is my feather. Recognize the church steeple in the background? The feather floats past it in the opening scene of Forest Gump. Yeah, I didn’t remember it at first, either. What is that ghastly white thing in the corner? Sorry! The Ships of the Sea Maritime Museum really impressed me. Again, Eric’s love of all things transportation. The house that holds this collection is called the Scarborough House. 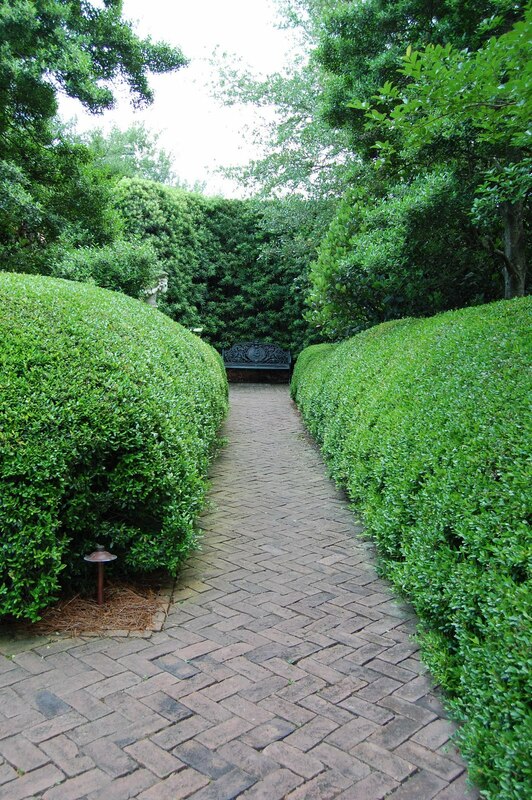 It has beautiful gardens with undulating bushes that bring to mind a heaving sea. 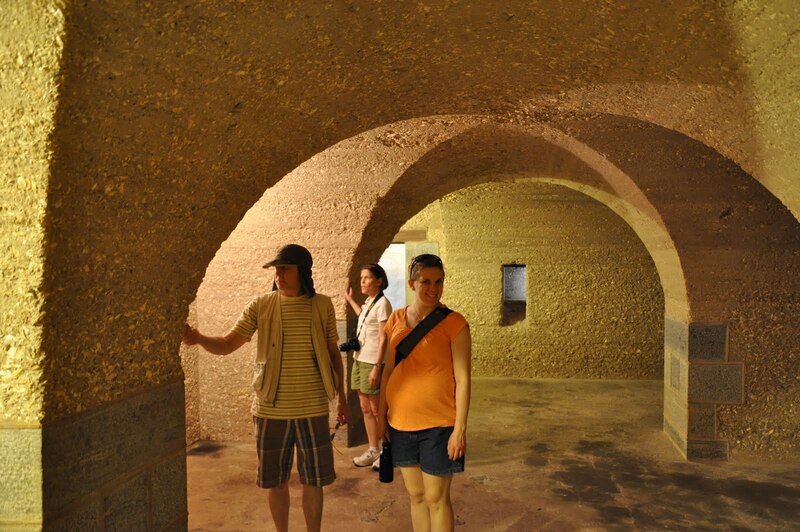 The house itself is dark and dreamy, like being in the underbelly of a ship. The collection has an impressive array of model ships, paintings of ships, scrimshaw, and other various maritime items. 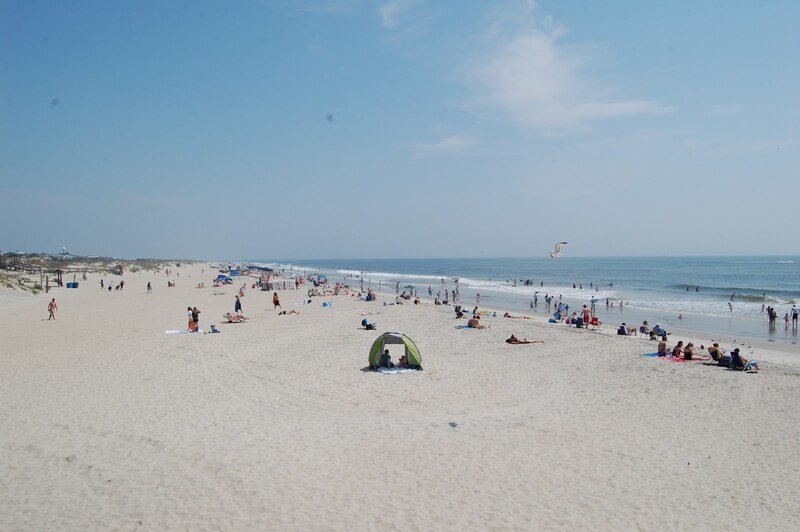 We did find time to make a quick trip to Tybee Island. Alas, with no swimsuits, towels, or kites, we were left to only watch the swimmers. 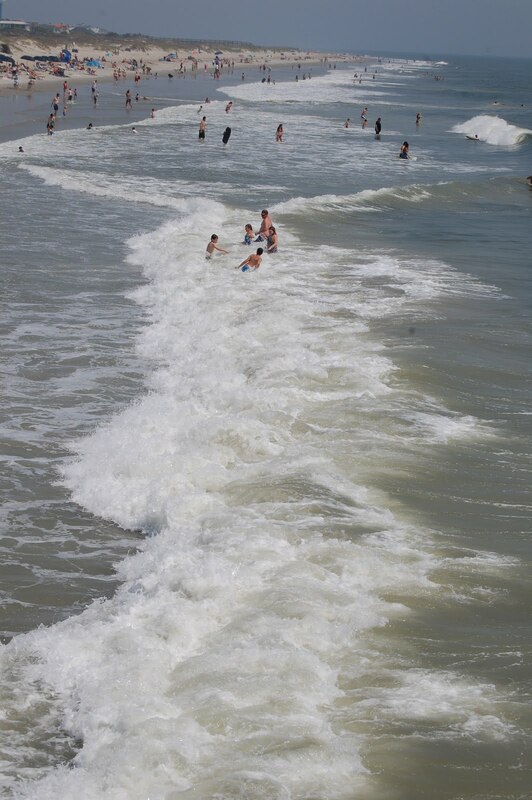 The surf was steady and the wind strong that day – I was fine just sticking my toes in the sand and watching the fisherman line the pier. This was a much more touristy beach spot than I had realized. The beach was nice, but the charm of Savannah was the real treat of this trip. We met a friend for lunch who was currently attending Savannah College of Art and Design. Her stories of this lovely place were exciting to hear. With the impending birth of my daughter, this was a perfect way to wind down the trip. 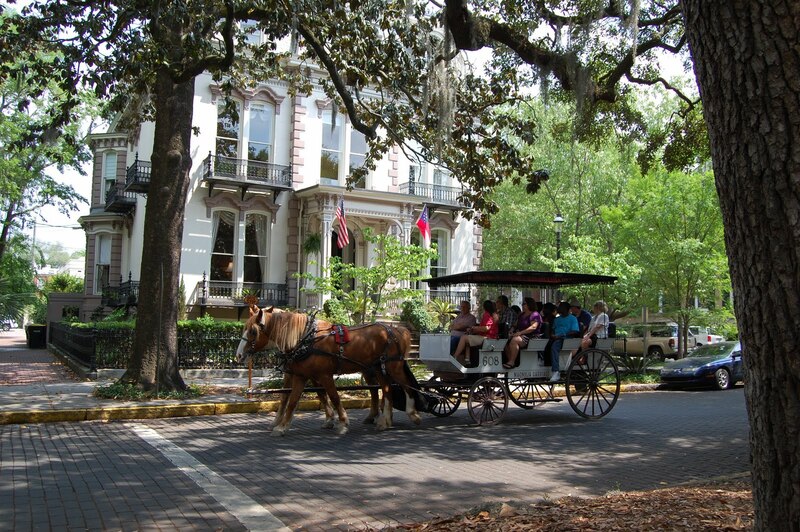 Savannah was the perfect spring get away – plenty of walking, eating, art, sight seeing, and relaxing. 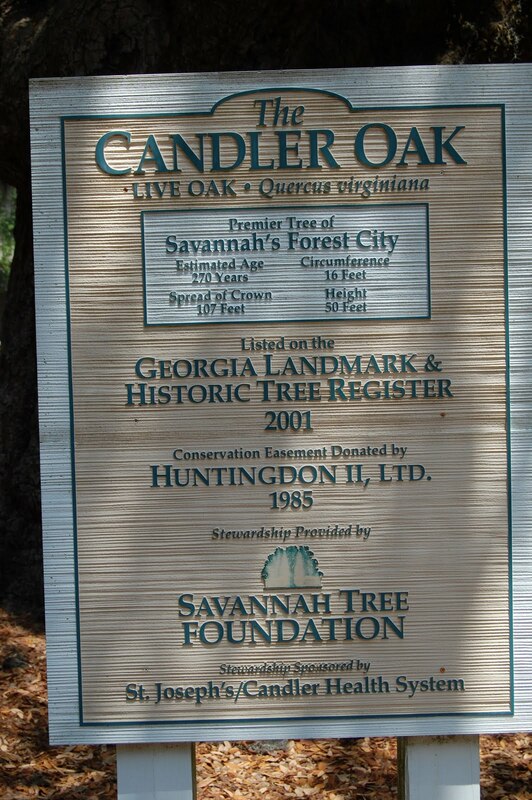 Hopefully, sometime in the near future we will get to the sister city – Charleston. Even the Savannah airport has a square inside! 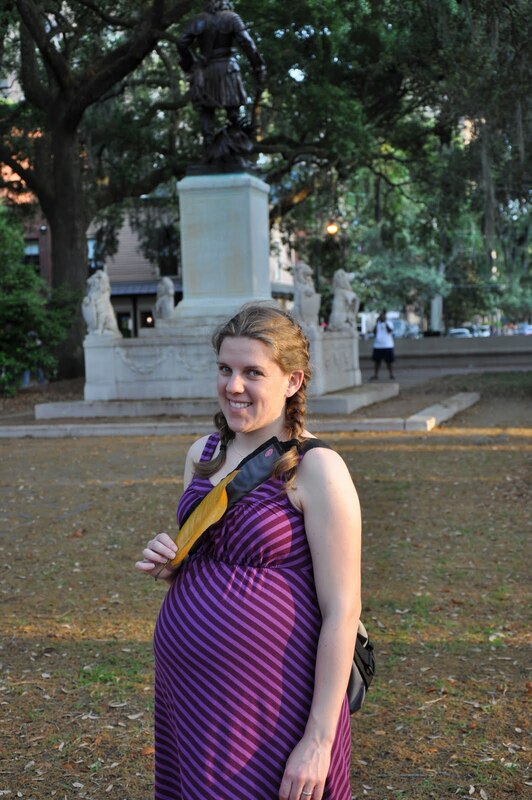 Of course we did visit Forsyth Park and the iconic fountain, however the image seems to be missing. I will keep hunting. Until then, visit this site to see the spectacularly famous fountain seen on all postcards, key chains, and brochures of Savannah. What is your favorite day dream vacation spot? I think mine is still Key West. Ugh, I have been home sick this week. Hence the delay between posts. 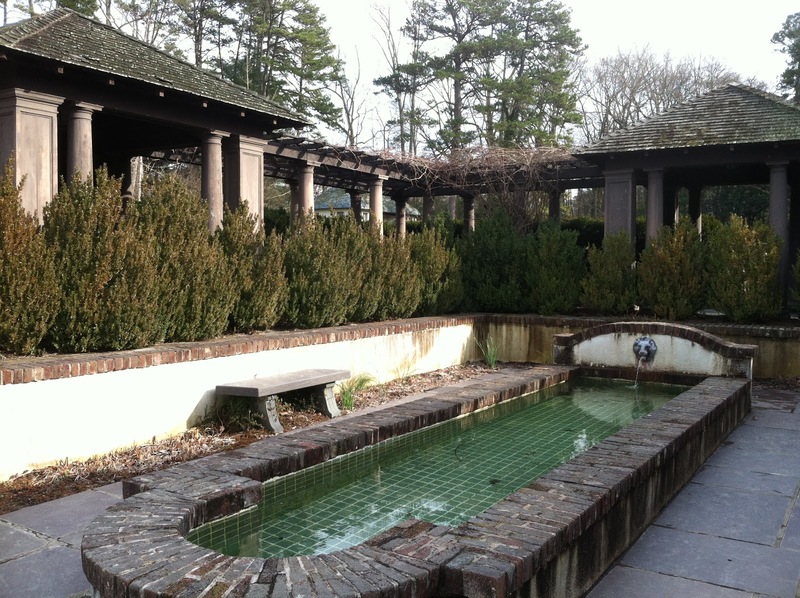 Anyway, here is a oldie but goldie project for you plus a fun day trip idea to Winston-Salem, NC. One of the first things we updated in our house were the windows. The old ones were charming with the old wavy glass and nice lines, but they were drafty and loud. We upgraded to new windows with the double pane to insulate against traffic noise, trains – general city noise and also to keep as much of the air we like inside the house. Some of the old windows were beyond saving but a few were decent. I grabbed a few of them to re purpose. This one was a smaller size from the kitchen. I cleaned it up, sanded a few areas, sprayed with a clear coat to prevent future flaking, and then mounted picture frame hanging hardware on the back side. I hung it up in the dining room as an easily changeable artwork gallery. 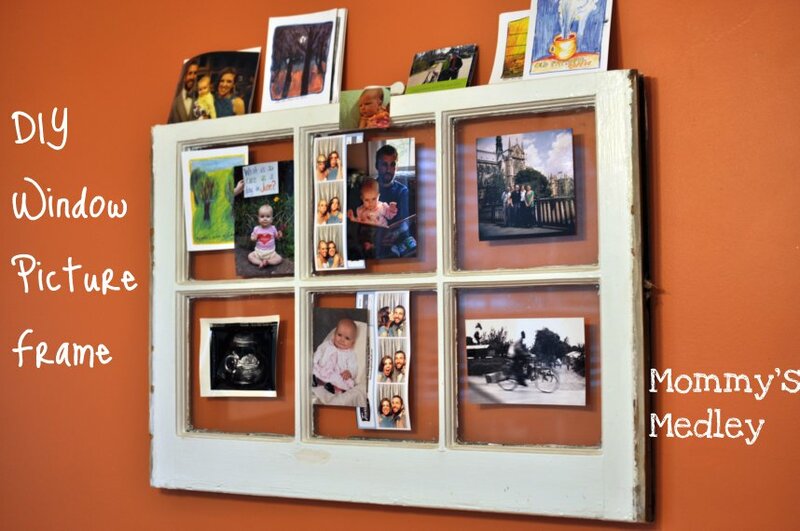 I simply use double-sided tape or the clear scrap booking corners to affix postcards, photographs, cards, and other mementos to the windowpanes. Greta greatly improved by Sunday and since the weather was so nice, we decided to check out an art exhibit at the Reynolda House in Winston-Salem. 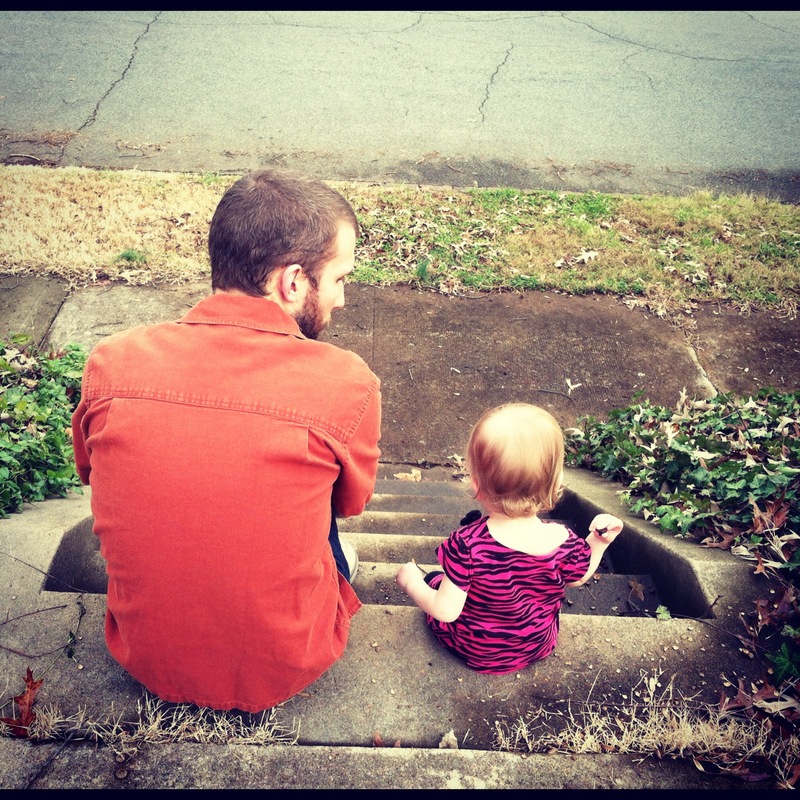 While I packed a diaper bag, snacks, and water bottles, these two cuties sat on the step and threw acorns. Greta is loving all her new abilities these days. She is growing in leaps and bounds. Anyway, on to the Sunday visit. The Reynolda House of American Art is the former private home of Richard Joshua Reynolds, founder of R. J. Reynolds Tobacco Company. 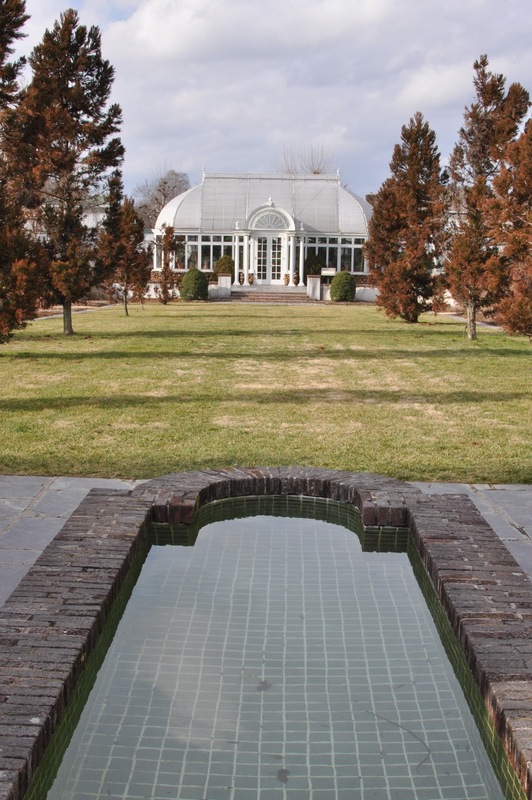 The house originally was on a 1,067 acre estate, complete with greenhouses, a glassed-in pool, gardens, basement roller skating, basement bar, beautiful furnishings, barns, gardening buildings, and many more outer buildings. 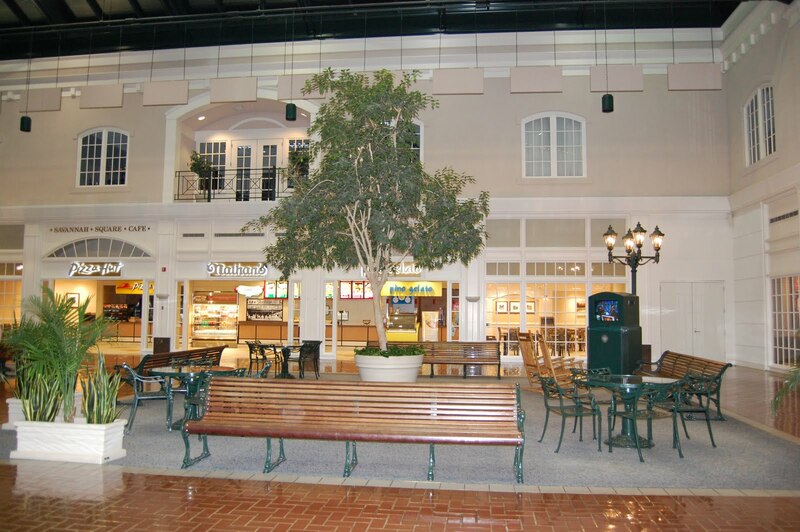 These outer buildings have since been turned into a shopping area known as Reynolda Village. The house was turned into an art museum in 1967. The interior of the home has been restored and finished to way it would have looked when the family lived there. 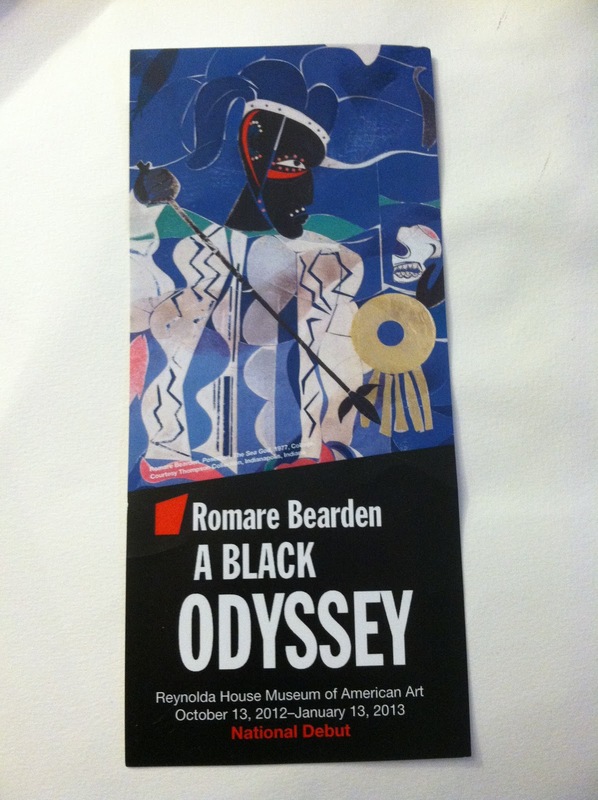 This was the closing day of an exhibit I had been wanting to see all winter – The Black Odyssey by Romare Bearden, one of my all-time favorite collage artists. He was born in Charlotte, NC in 1911 and died in New York in 1988. The works were fantastic – large, brightly colored collages, often featuring contrasting complementary colors. Bearden artfully adapted Homer’s Odyssey into the theme of the Great Migration, a movement in which Bearden’s family was a part of. 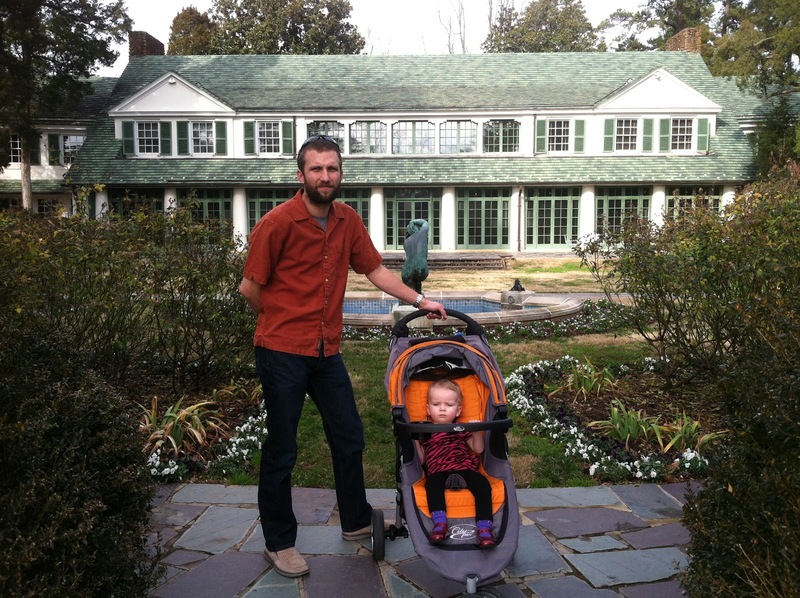 After viewing the exhibit, we headed outdoors to the gardens to walk around a bit. 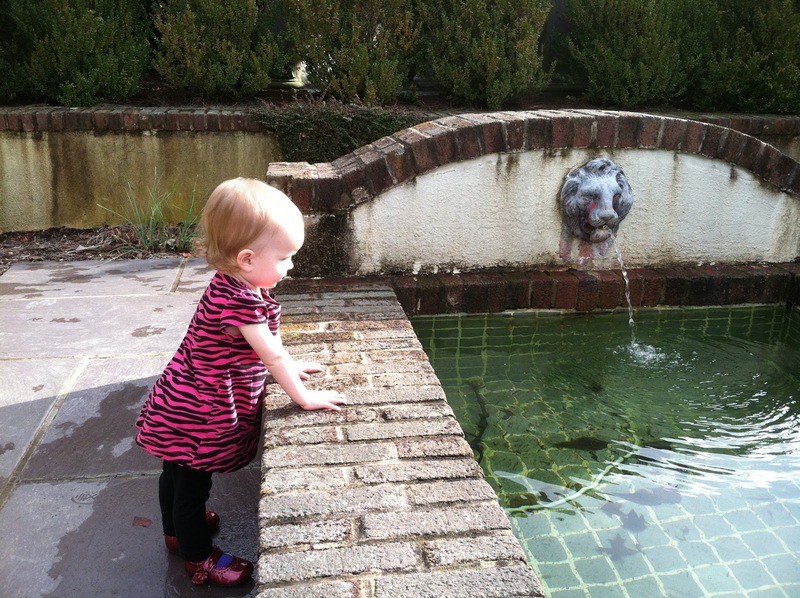 Greta was fascinated by the lion water fountain. She loves to roar at lions now. 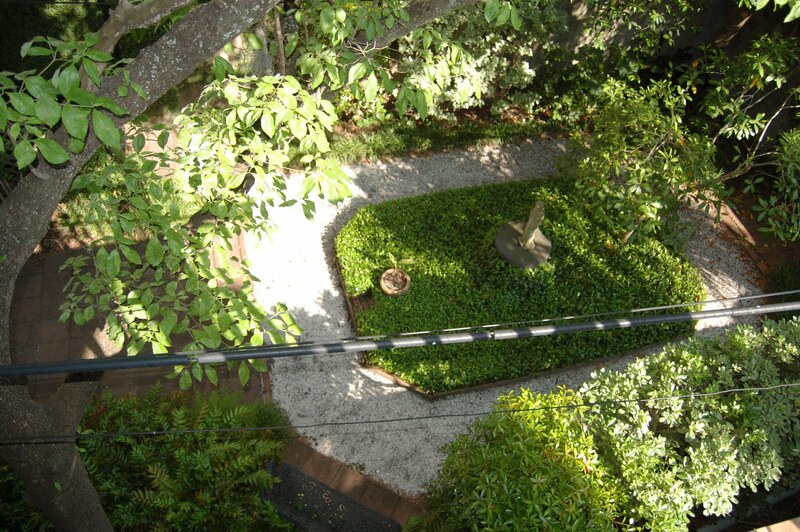 The pool is in a space surrounded by lovely walkways and usually green vines. This arbors’ vines created interesting lighting on this sunny day. The view looking from the pool, toward the greenhouse and Reynolda Village.